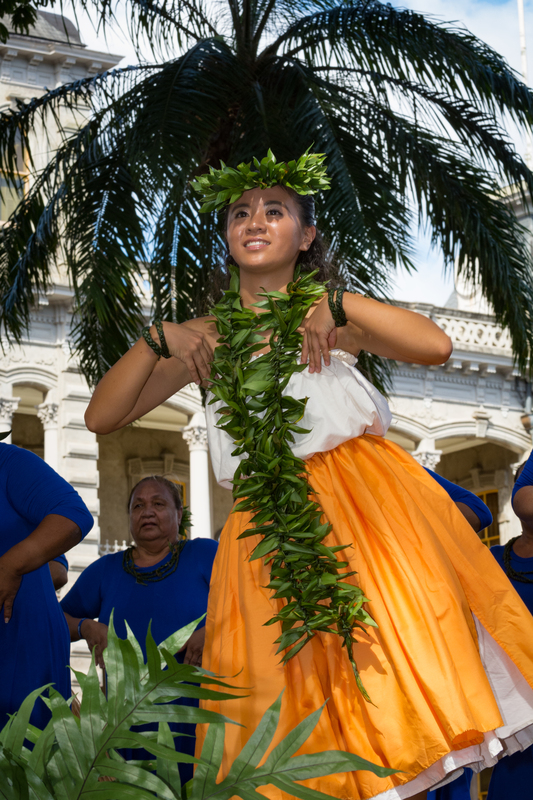 I Mua E Nā Pōki’i, Move Forward, O Youth, is the theme of the 42nd Annual Prince Lot Hula Festival, which will take place at historic Iolani Palace in 2019 on Saturday, July 20, from 9 a.m. to 4 p.m., and Sunday, July 21 from 9 a.m. to 3 p.m., announced Moanalua Gardens Foundation (MGF), the festival’s presenter. 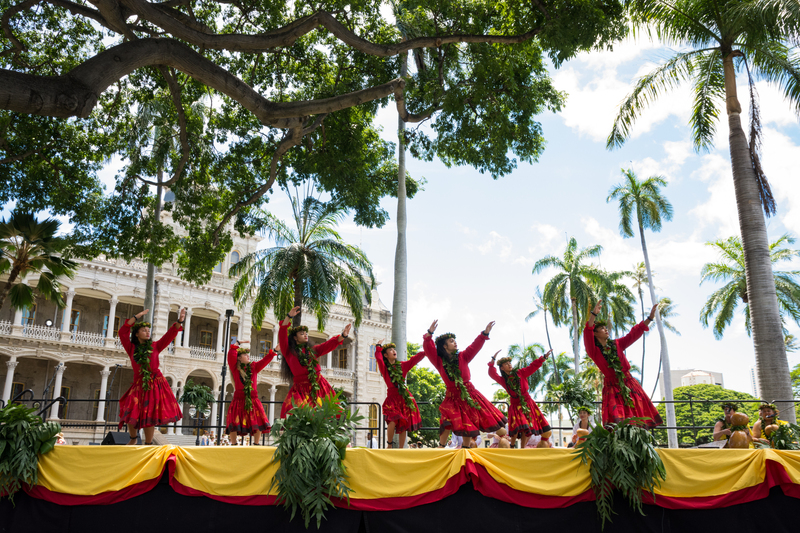 The largest non-competitive hula celebration in Hawai‘i, the festival honors Prince Lot Kapuāiwa, who helped reprise hula and reigned as Kamehameha V from 1863 to 1872. 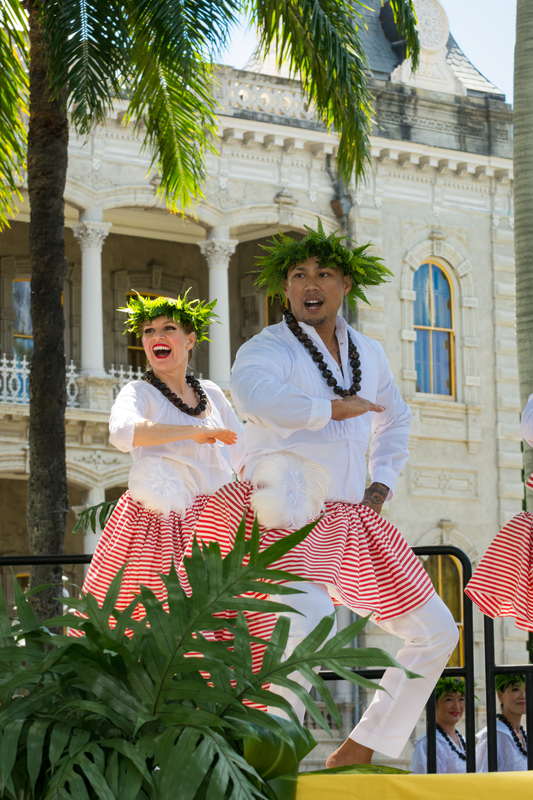 The festival returns for the third year to Iolani Palace to celebrate two days of hula where Hawaii’s ali’i, including Prince Lot, lived and ruled. 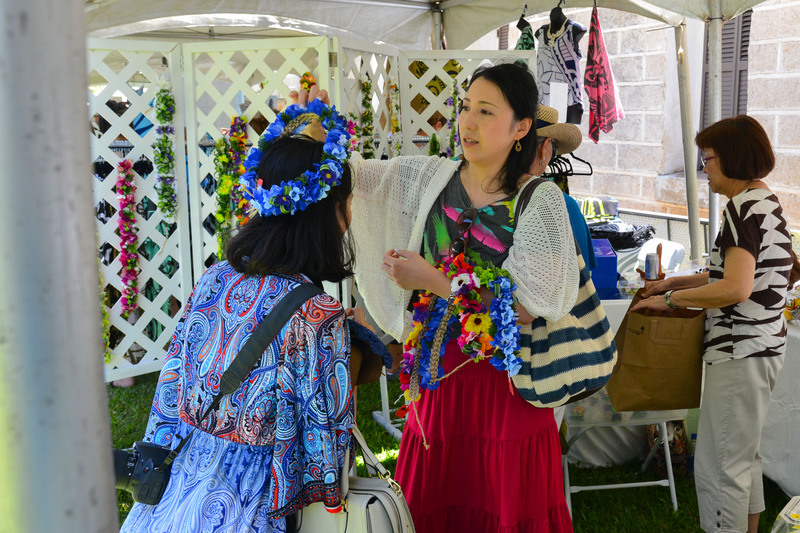 Founded in 1978 by MGF as a gift to the community, the festival now attracts thousands of residents and visitors each year. 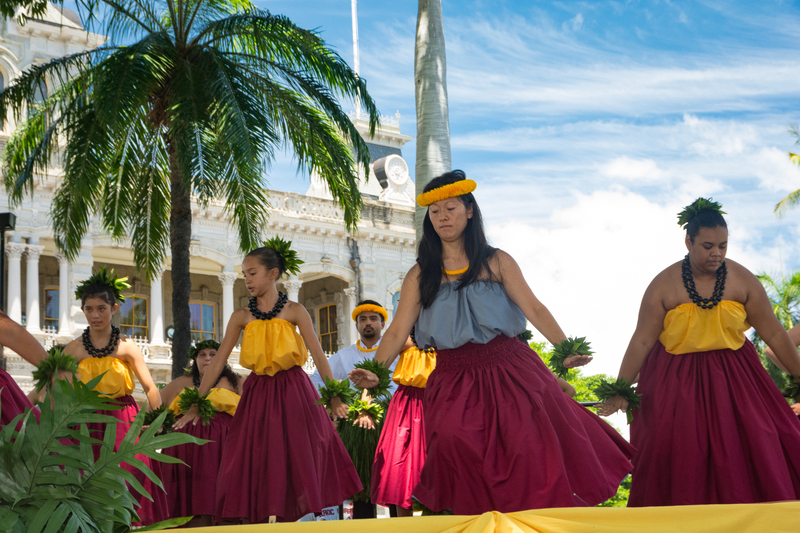 Opening ceremonies on Saturday will include the Royal Order of Kamehameha, presentation of MGF’s Malia Kau Award to renown Kumu Hula Iris Naleialoha Napaepae-Kunewa of Hawai’i Island, followed by an impressive line-up of premier hālau hula (hula groups) who will perform both kāhiko (ancient) and ‘auana (contemporary) hula. 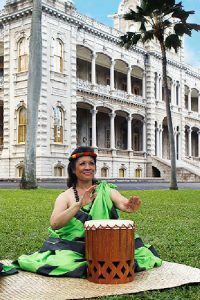 On Sunday, MGF will honor respected chanter Kamuela Chun from Hilo with its Namakahelu Oli Award as part of the opening program. 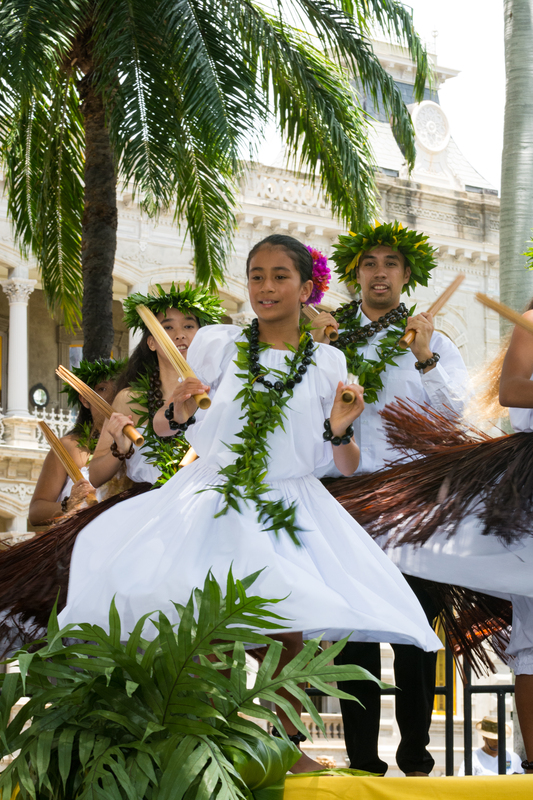 The event will also feature a Hawaiian-themed craft fair, cultural demonstrations, and more. 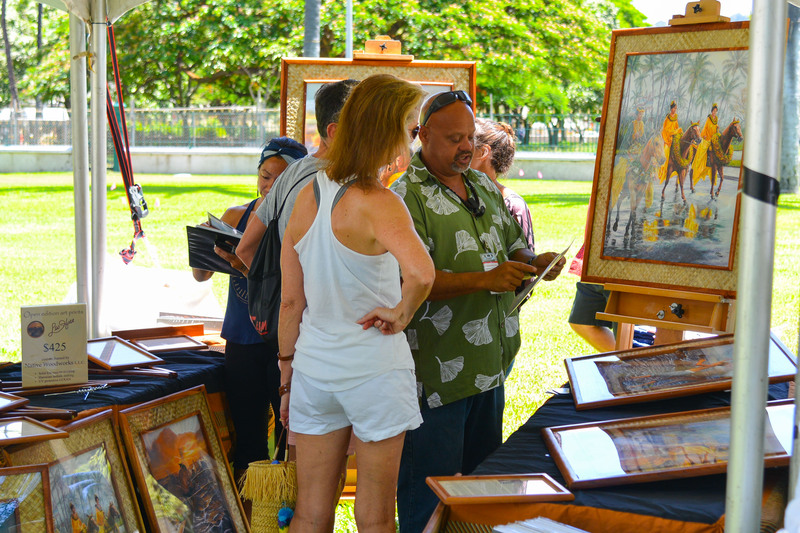 Local food and refreshments will be available for purchase throughout the day. 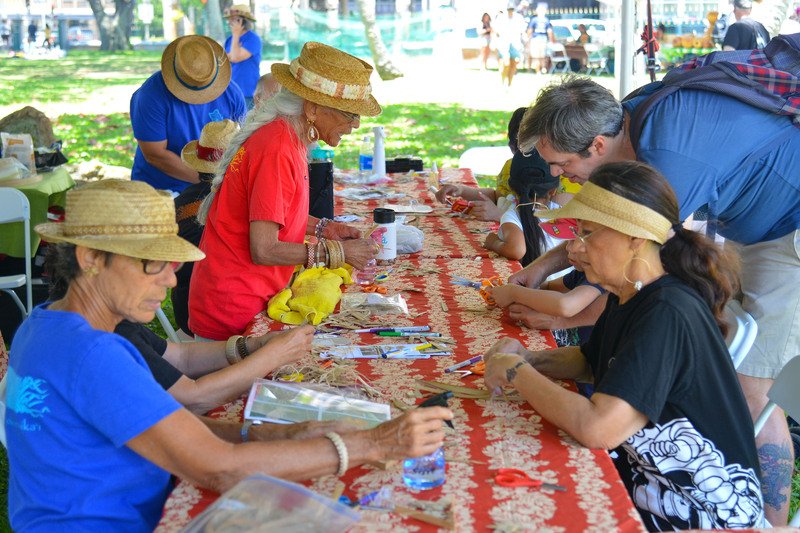 Limited edition tee shirts and souvenir kōkua buttons will be on sale. 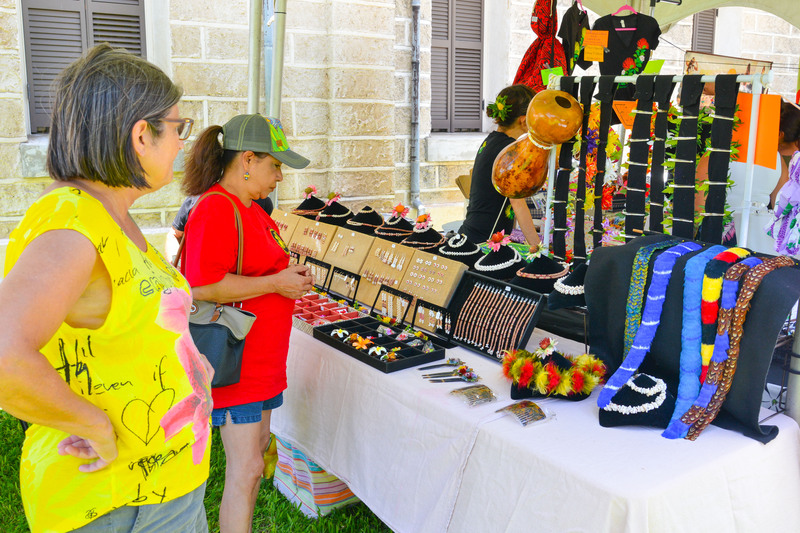 Proceeds from these merchandise sales will help cover the costs of the festival. 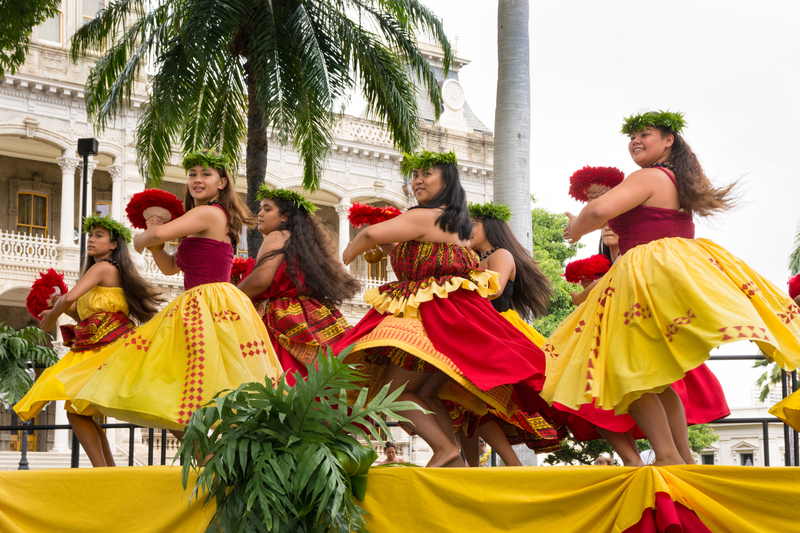 The public, and visitors, are welcome and encouraged to bring their beach chairs and mats and enjoy the fun, food and festivities in the magnificent setting of Iolani Palace. No commercial photography is allowed. 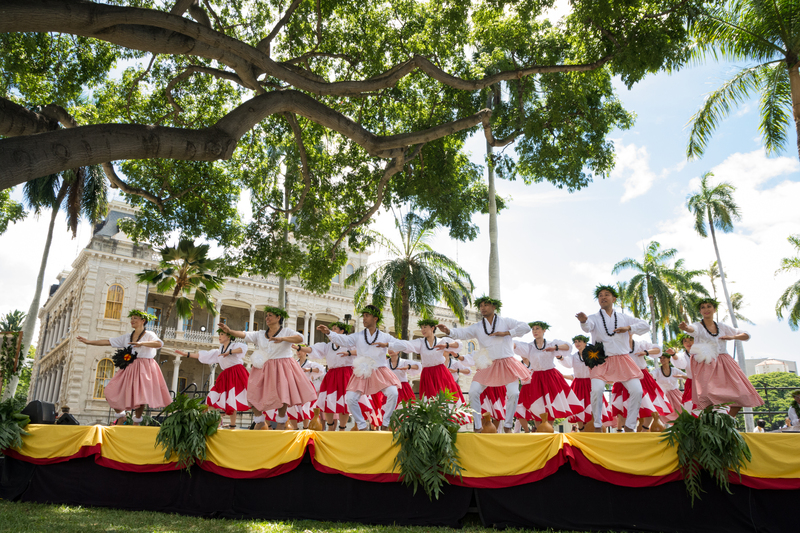 Participating hālau and a festival performance schedule will be announced at a later date. 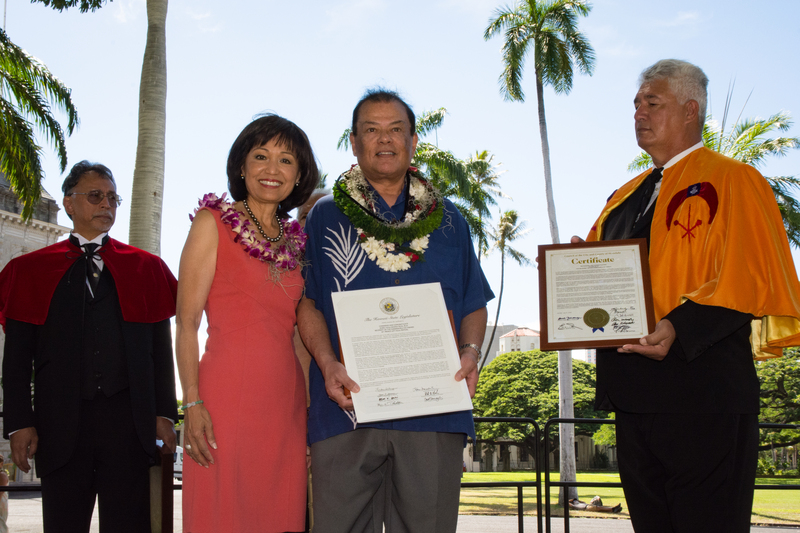 For more information, please call 808.839.5334. 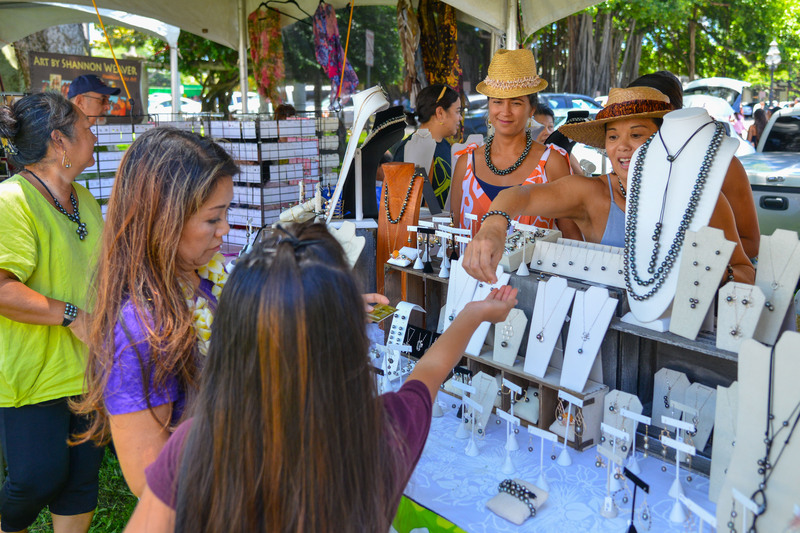 Wrap up your holiday shopping at smile.amazon.com/ch/99-0143900 and AmazonSmile donates to Moanolua Gardens Foundation Inc.
~ Mahalo a nui loa to all of our major sponsors who helped make this year’s 41st Annual Prince Lot Hula Festival at Iolani Palace a great success! 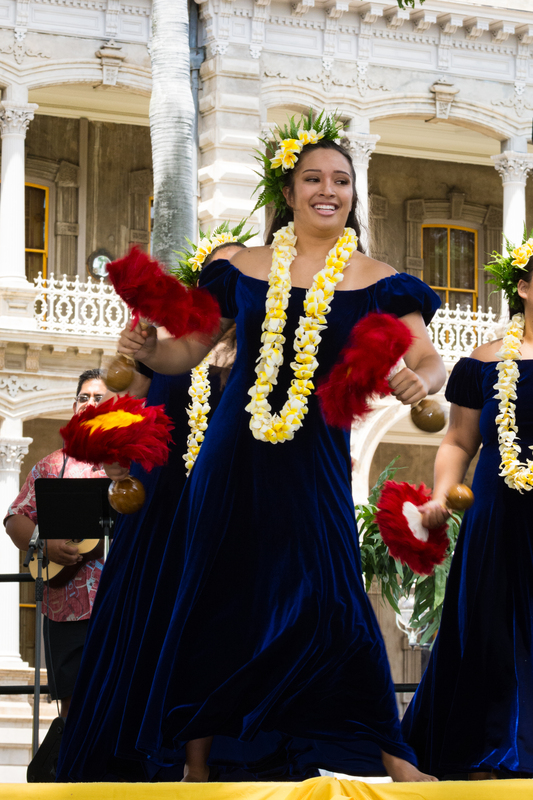 New sponsors: Douglas Emmett Management Hawaii, LLC and IATSE, Local 665, International Alliance of Theatrical & Stage Employees & Machine Operators. 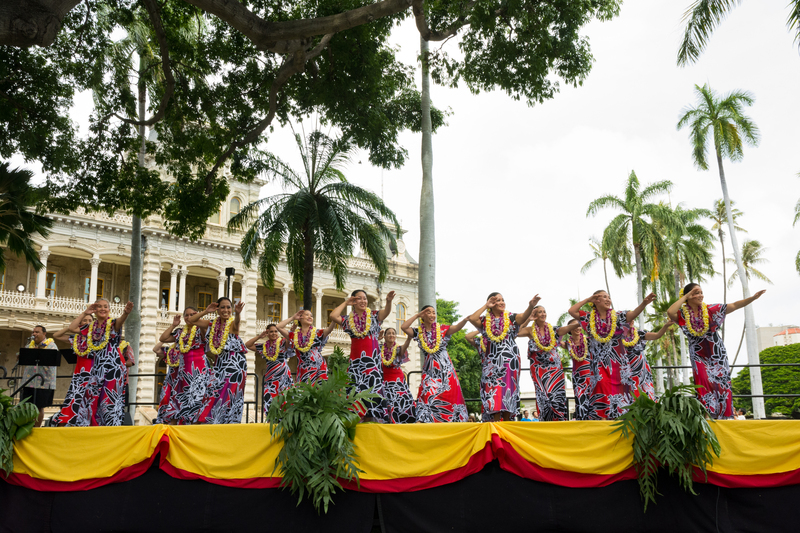 Friends of Iolani Palace, Pasha Hawai’i Transport Lines, Cadinha and Company, Ironworkers Union, Local 625 and Ironworkers Union, Local 625 Stabilization Fund, Laborer’s International Union of North America, Local 368, KINE Radio/Summit Media Corporation and Urgent Care Hawaii. 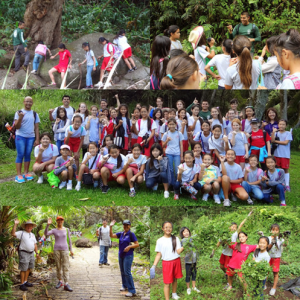 The 2018 PLHF was another success! 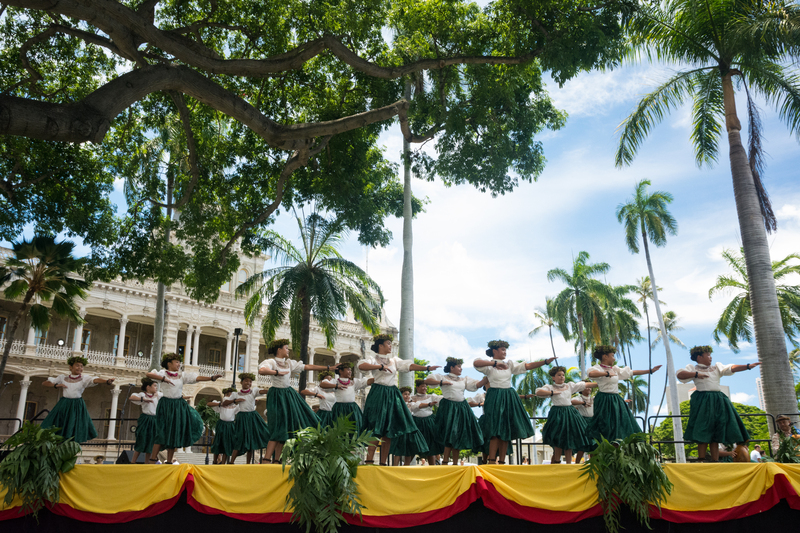 It settled gracefully into its new venue and once again, for my 33rd year, I have witnessed the beauty and love and intensity of a cherished tradition. I was amazed at how just a few adjustments made the perfect setting this year in our new venue. 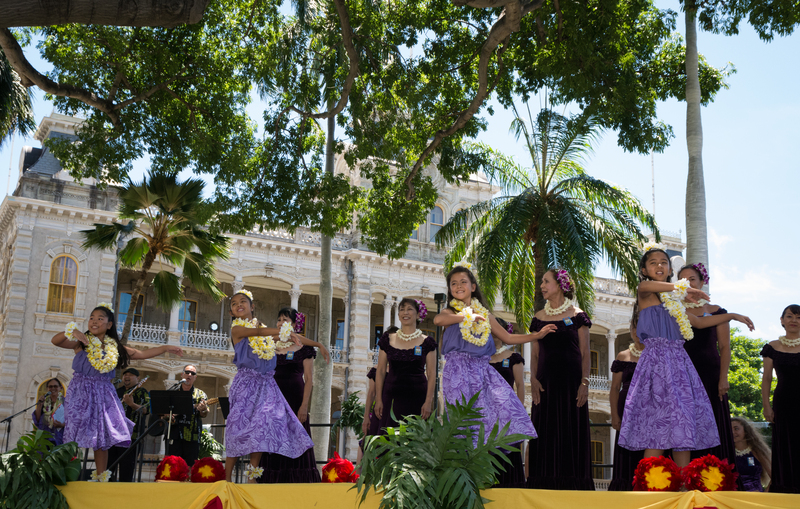 Locating the stage with Iolani Palace in the background was brilliant. 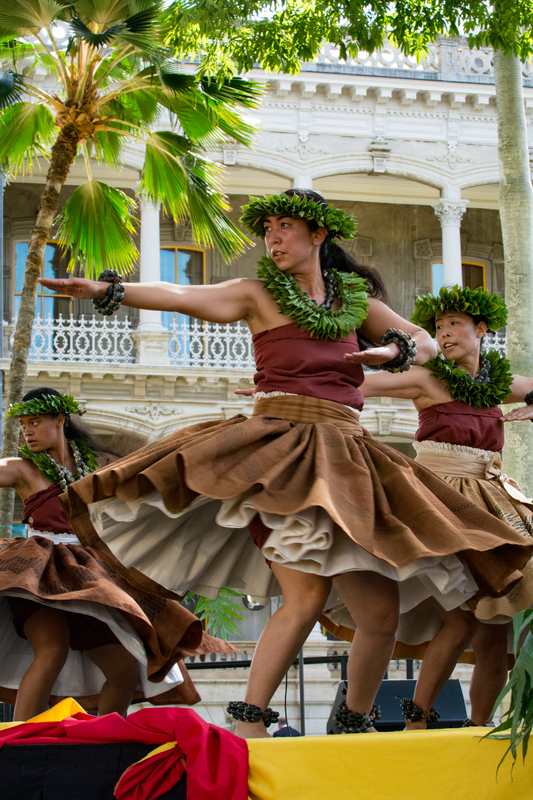 The stately edifice is a perfect tie-in to the journey of hula throughout Hawaii’s history. 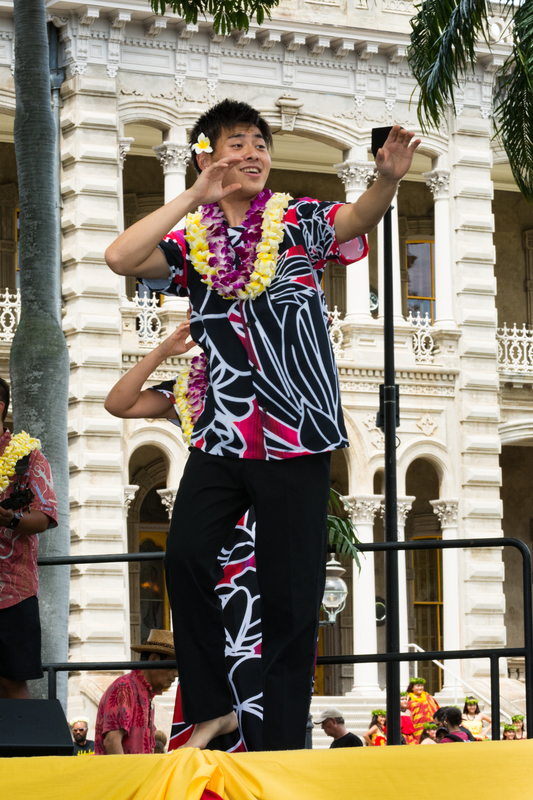 And staging the festival downtown among the historical setting lends well to drawing tourists as well as locals. It was obvious that our crowd was larger, especially on Sunday. Just as last year, I was impressed with the recipients of awards. 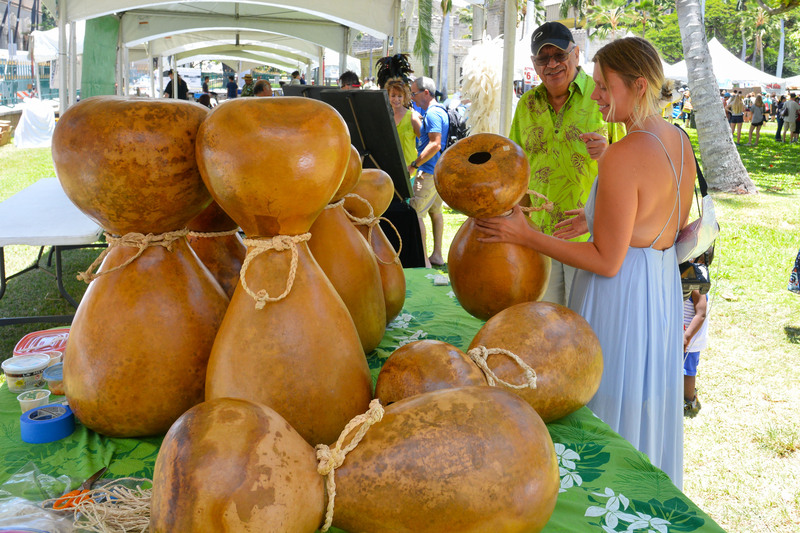 Interestingly for me there was a connection with one of last year’s hālau and the recipients of Saturday’s award which brought this full circle. Last year I saw Halau O Kekuhi, I believe for the first time, and an immense impression was left on me because of their level of expertise. 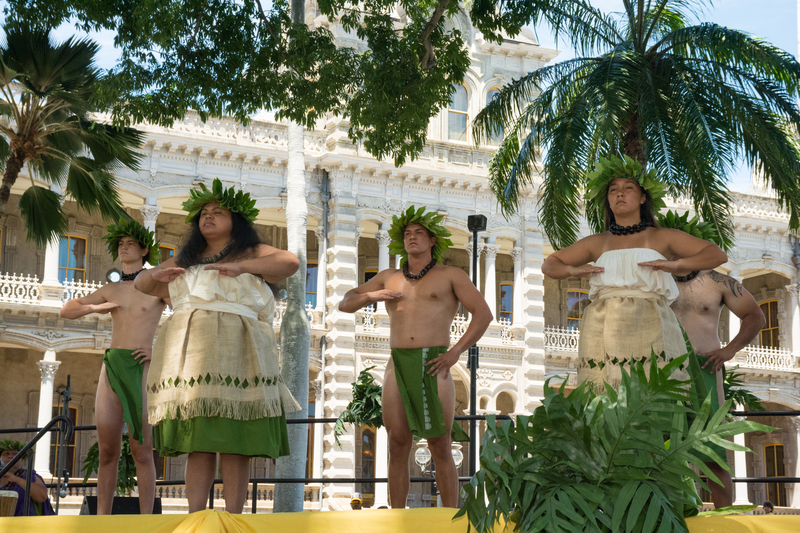 Interestingly a few months later, I realized I would be seeing them again at a Southern California venue that I attend each year when they present their Hawaiian Series. 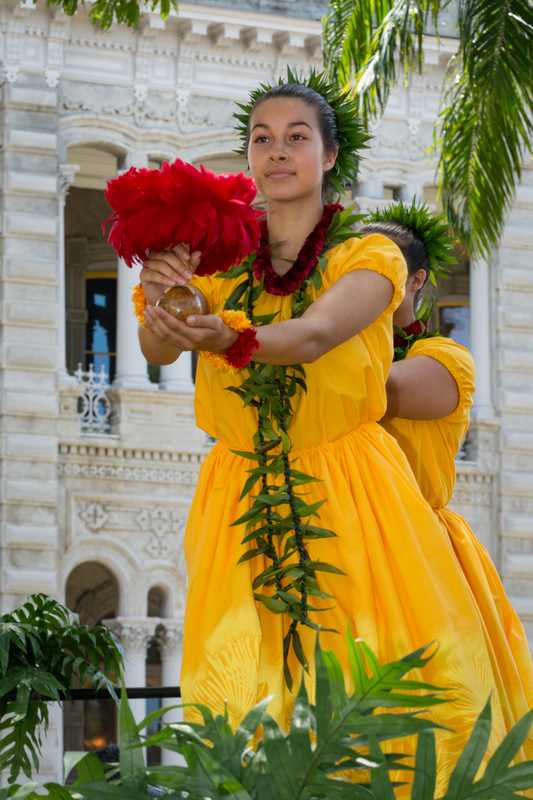 I was bursting with pride and excitement when I informed my best friend who attends the series with me that we would be seeing the best ever hālau. Needless to say, she was impressed beyond expectation after the performance. 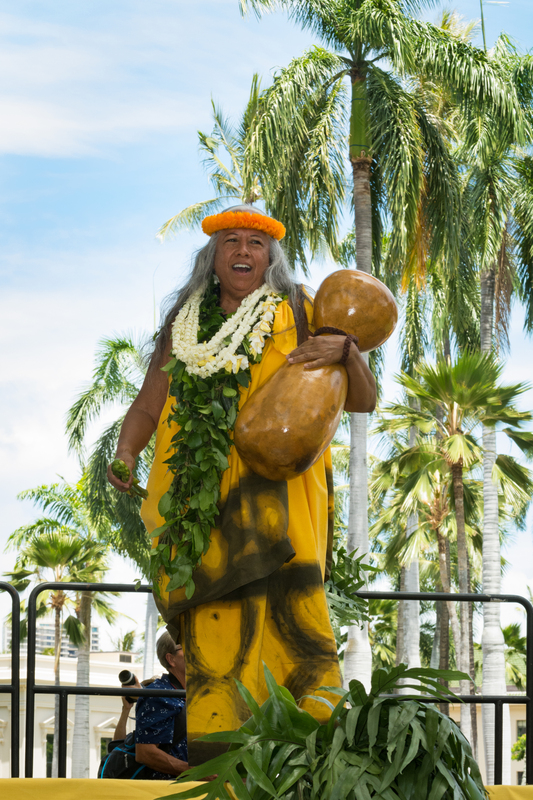 Then for me to return to PLHF this year and witness the bestowing of the Malia Kau Award to Nalani Kanako’ole and Pualani Kanaka’ole Kanahele for their contributions to perpetuating hula traditions through their hālau was without a doubt a full circle experience. This is a good example why I don’t intend to stop attending PLHF yearly. 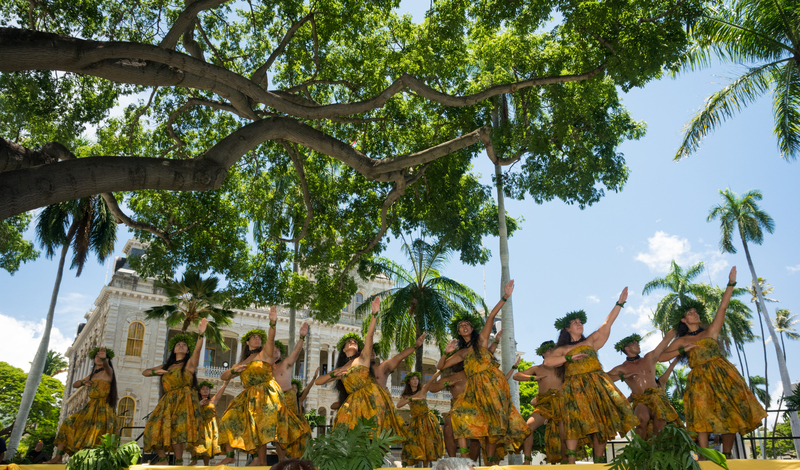 I so look forward every year to assisting with setup on the Friday and then enjoying the festival as a spectator. When I try to explain to friends or other attendees how much pride and happiness I experience each year, I have trouble holding back my emotions. Perhaps that comes with the aging process, but I truly feel that MGF and PLHF are my passion. My heart and soul are in this. 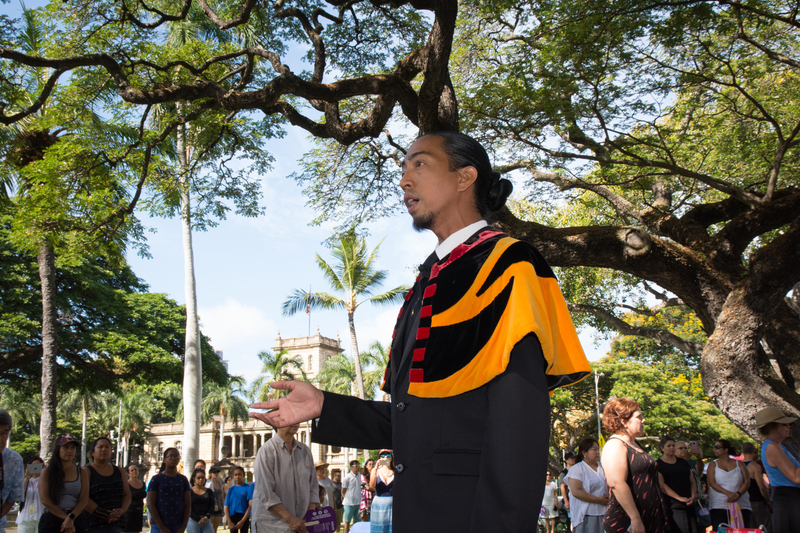 By attending since 1986 and volunteering since 1993, I am giving back to MGF, PLHF, and the state of Hawaii for all the joy and opportunities I have encountered. 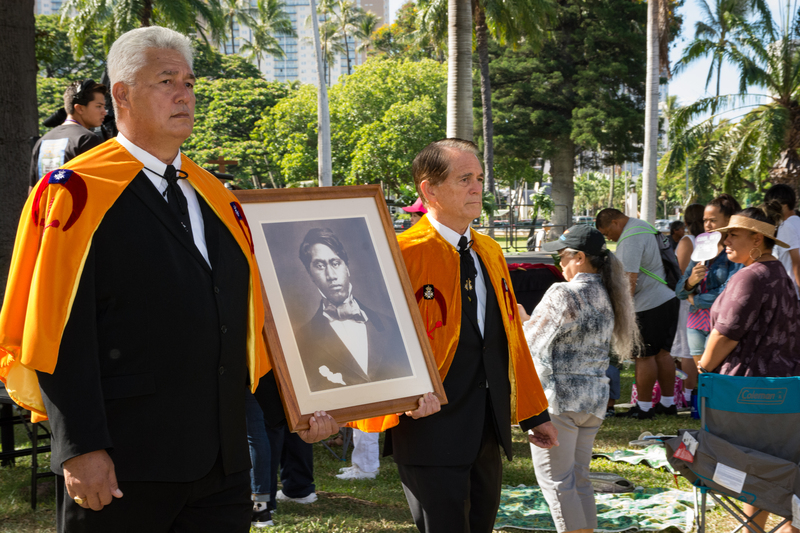 I am sure there are people who have dreamed about being able to become part of such a noble cause in a place they love which is not their actual home. I have been blessed with this opportunity and will continue being part of this until physically or mentally I can no longer travel or move. I pray that the good Lord will bless me with many more years of service. 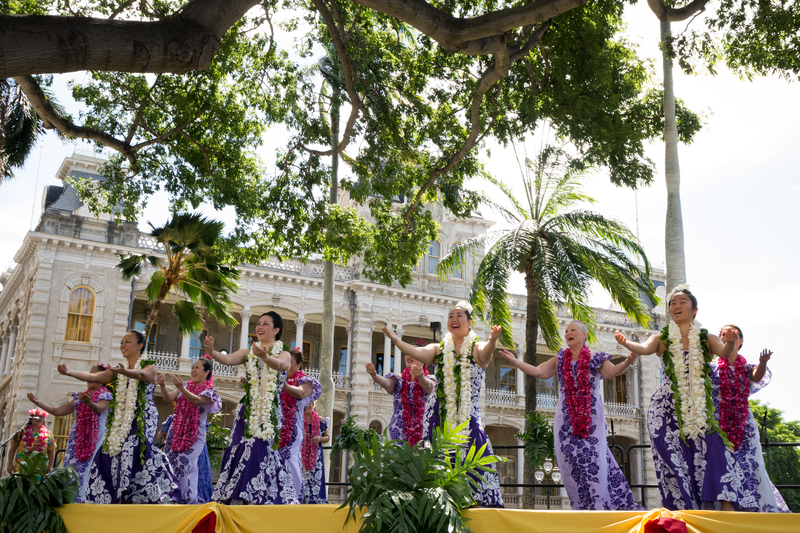 This is a simple mahalo for the glorious weekend of the Prince Lot Hula Festival XLI, Iolani Palace, Honolulu, Hawaii. As this is the 41st year I realized that I rather took this festival for granted. Every year as summer arrives I anticipate these two days in July. 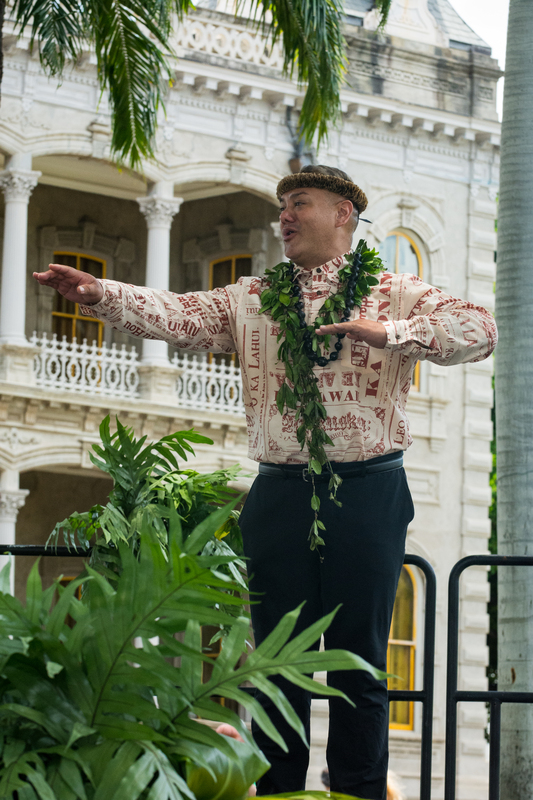 So as I sat on these historic grounds of Hawaii I felt such gratitude for the Moanalua Gardens Foundation, the presenters of this festival, Iolani Palace, and all who work year round to make it happen. 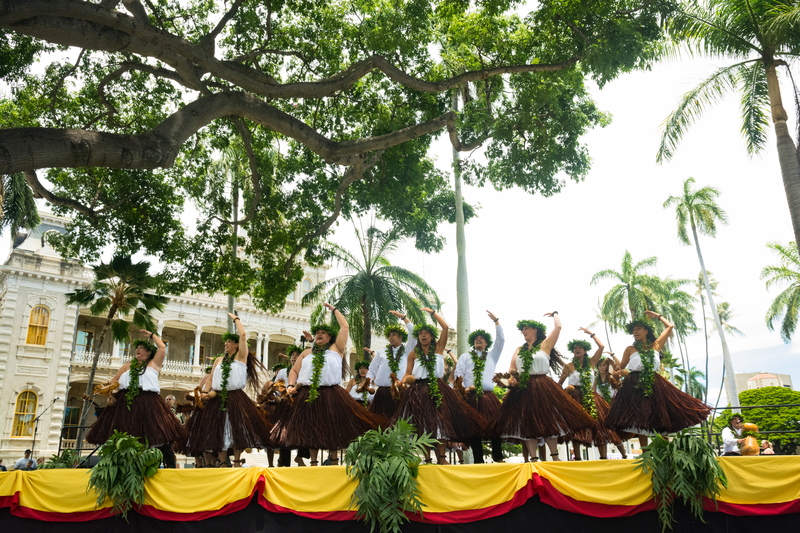 This is a mahalo for all the Hālau who were extraordinary this year in their performances. 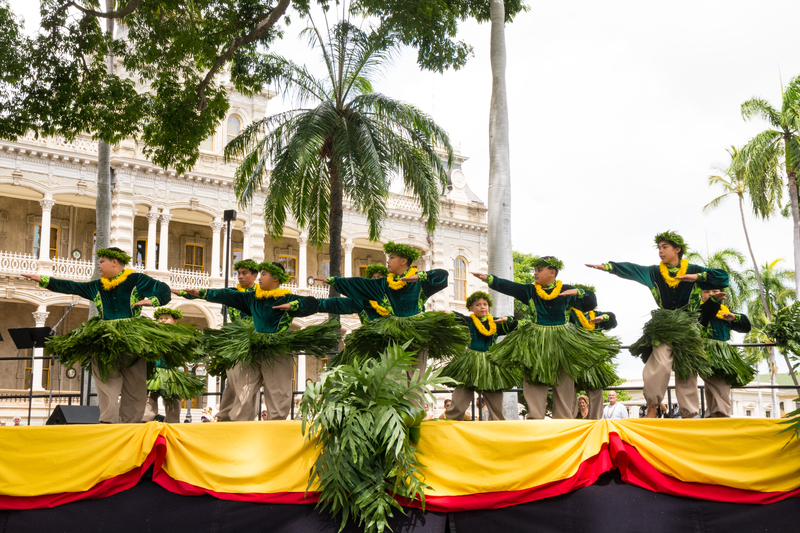 Their dedications to your theme, Ka Hanohano O Kamehameha, in the dance brought smiles and tears of joy. 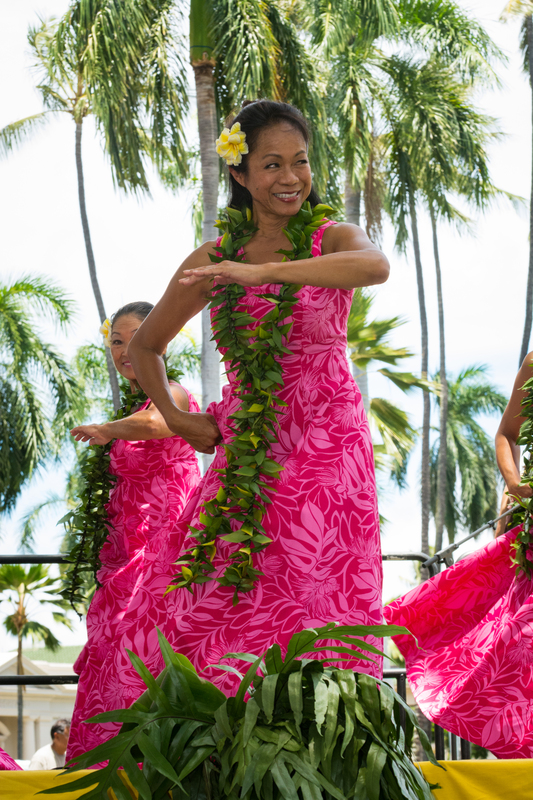 The dancing was inspirational in the strength and pure beauty of hula. I know we are the recipients of years and years of practice and study. 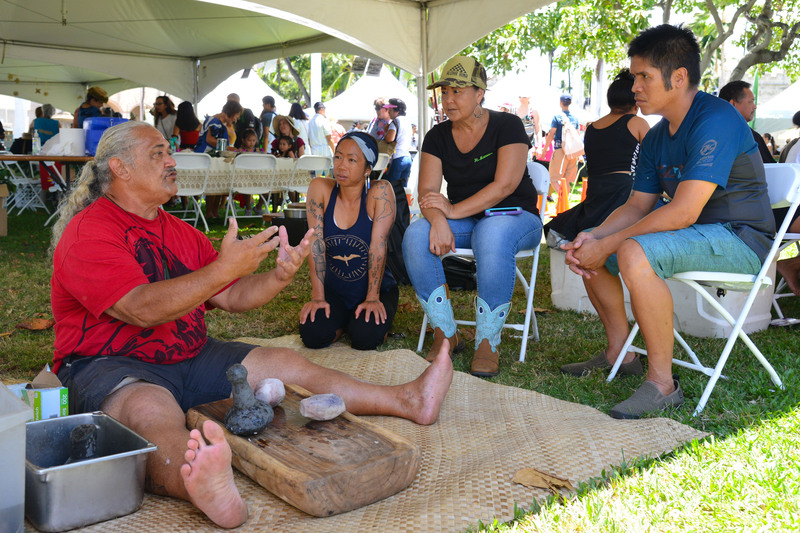 This a mahalo to all the cultural practitioners who displayed their work and shared their knowledge of the Hawaiian traditions with us. 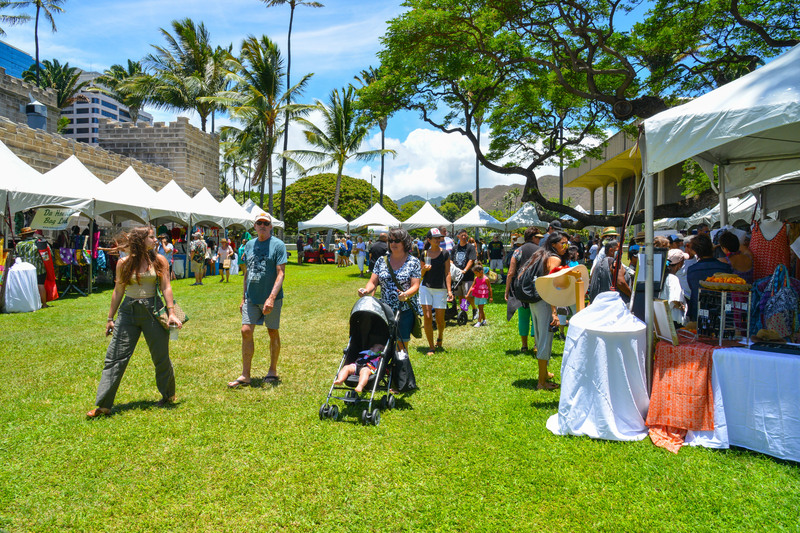 What fun for us to eat delicious food and shop in the arts and crafts booths. 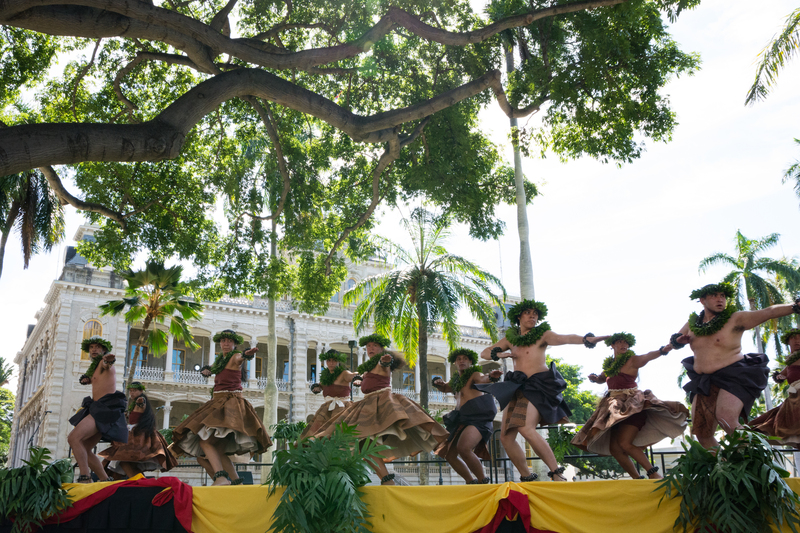 Sitting under the shade trees watching the dancers against the backdrop of Iolani Palace seemed a honor from our present day Hawaii to the people of Hawaii past, to the ancient leaders and chiefs, to the Hawaiian Monarchy. 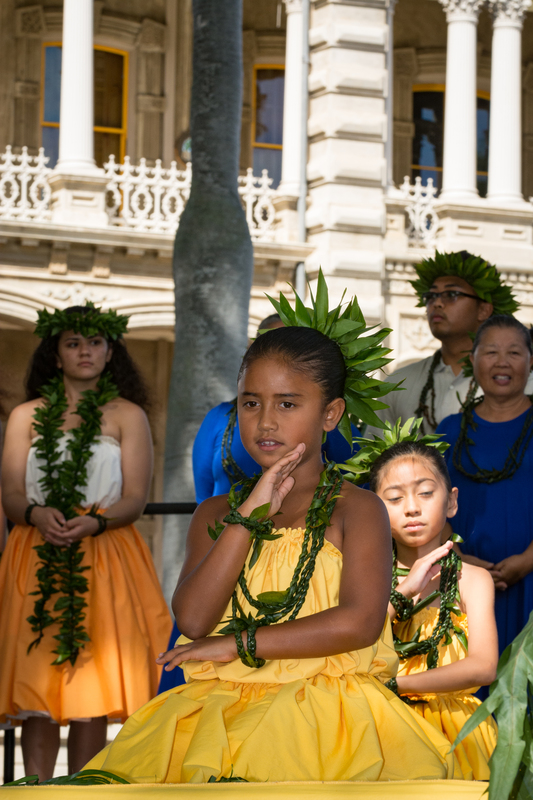 I saw the families with keiki and kūpuna together. There was so much happiness, laughter and unity during the entire weekend. 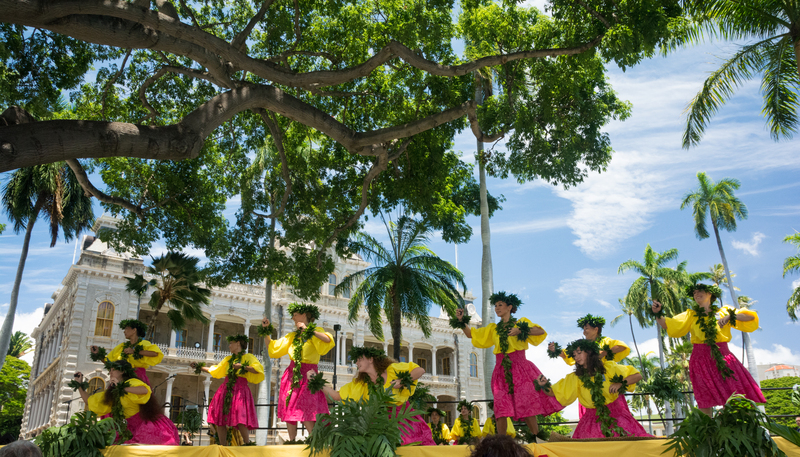 This celebration of the Prince Lot Hula Festival is a treasure for the people of Hawaii and visitors alike, representing the heritage of the very core of the Hawaiian Islands. 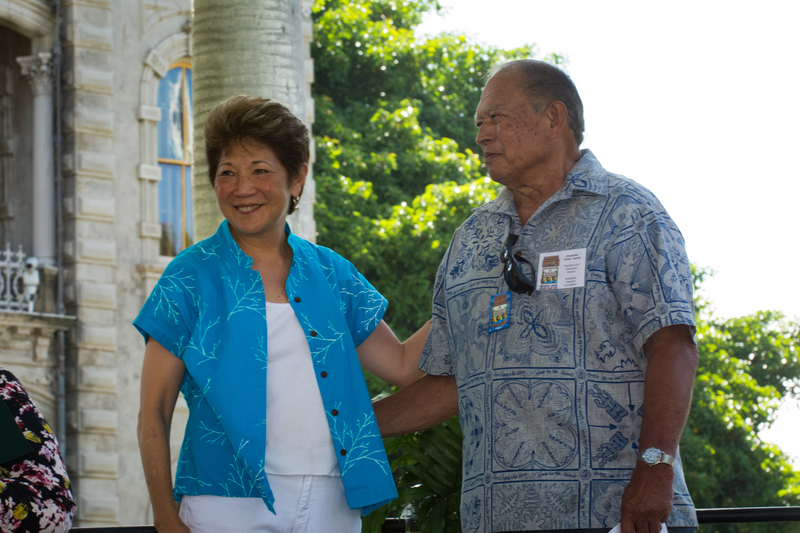 Mahalo again for your dedication, work and the work of Moanalua Gardens Foundation’s Board of Directors, who continue to bring this venue to our community and to the visitors of our islands. 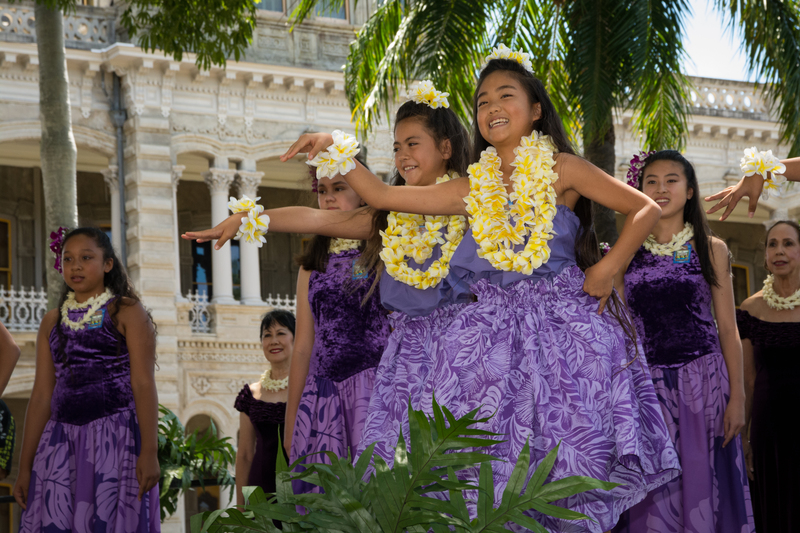 Moanalua Gardens Foundation always treats us like Royalty. Couldn’t be any better treated by all support staff and services. Excellent. 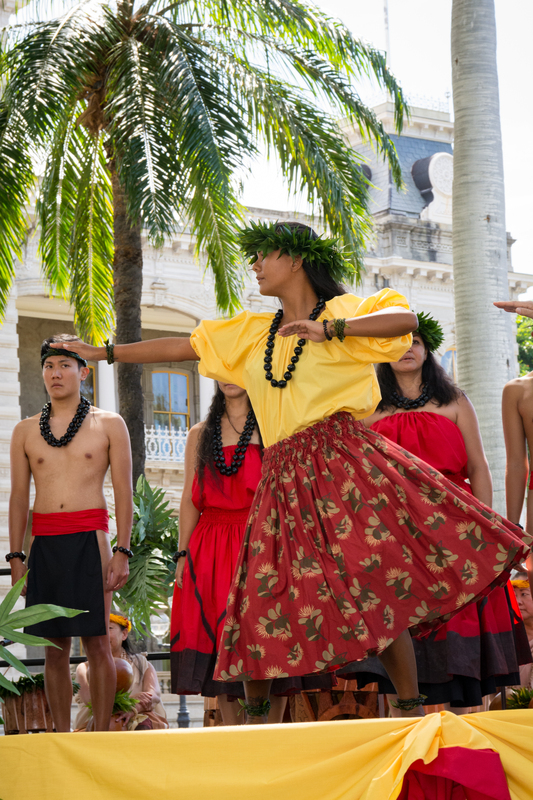 I liked that Iolani Palace is so Historical… people get the cultural connection of what we demonstrate and share. Excellent location. Many thanks MGF for always putting on a “First Class Event” consistently every year. Also kudos to your wonder Staff and team. 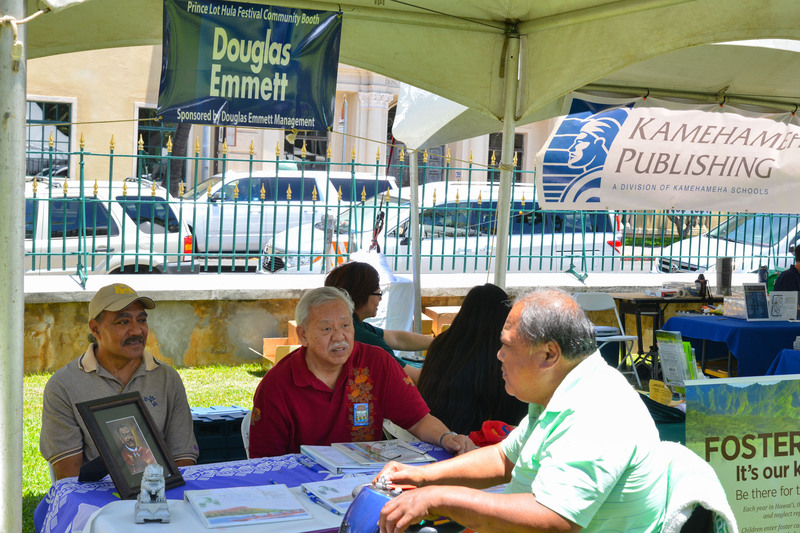 Mahalo for all your hard work in the coordination of this annual event. We appreciate all that you do to make this event a success. 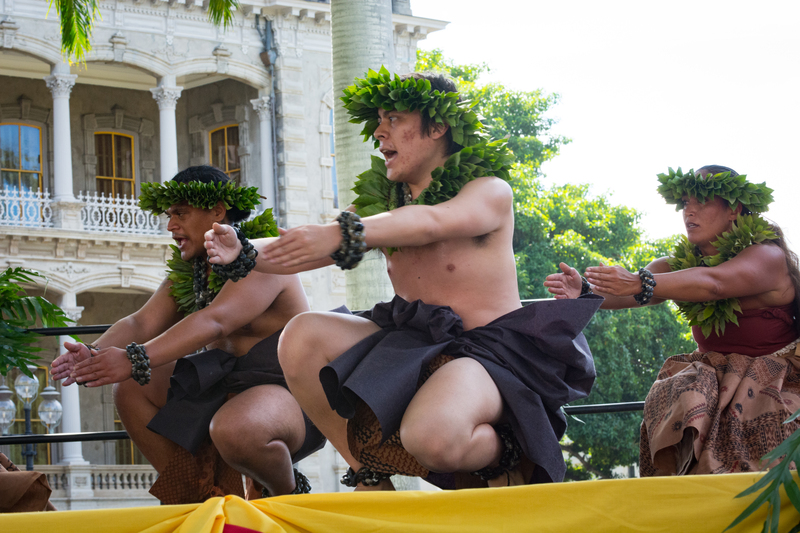 Mahalo a nui loa for your continued good works with and Annual Prince Lot Hula Fesival. 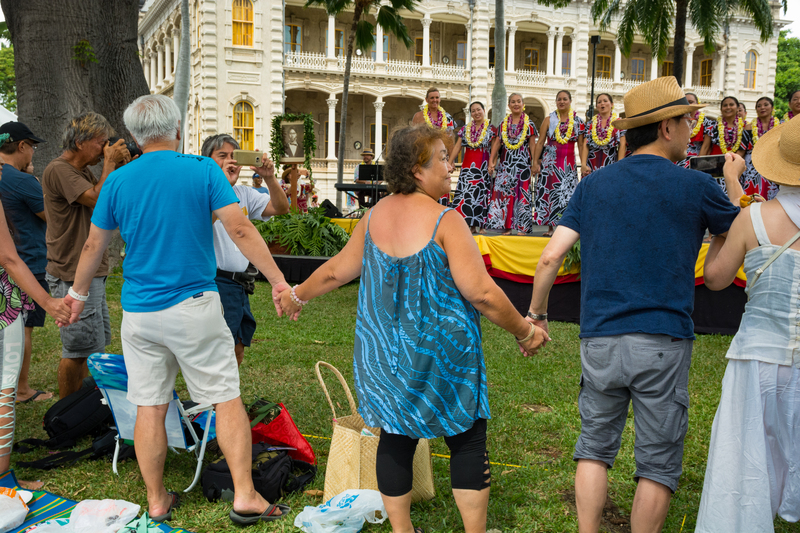 As always, I really enjoy this event, including the many hālau participating in Hula Kahiko and Hula `Auana in a beautiful non-competitive setting. 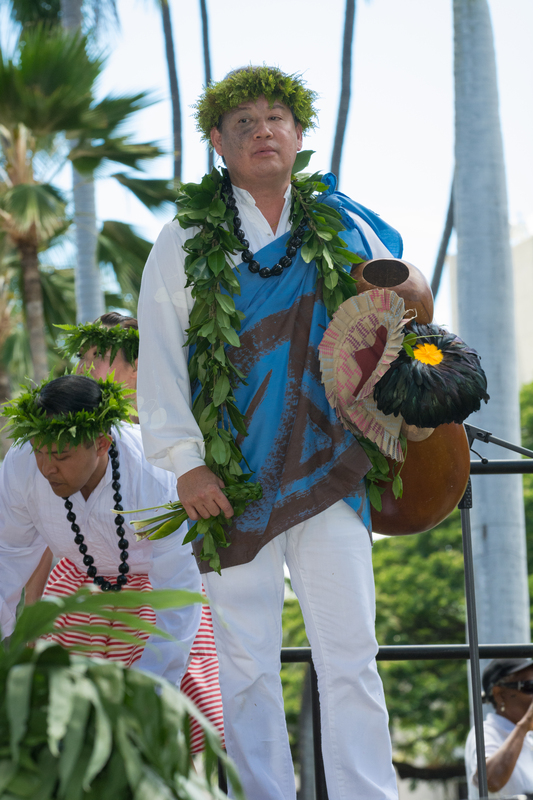 The dances were beautiful, likewise the musicians were excellent, with Kimo Kahoano doing an excellent job as MC. 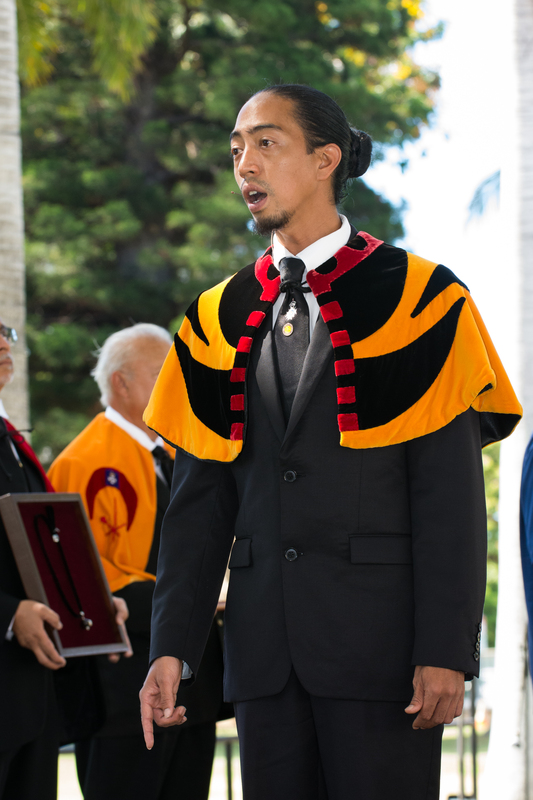 I enjoyed his narration and nahenahe style as MC. FANTASTIC. 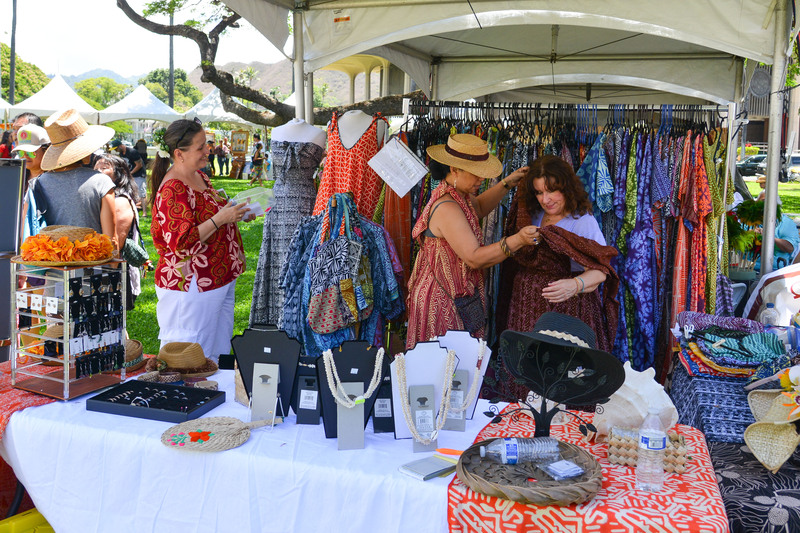 In addition, I always enjoy meeting with other vendors. 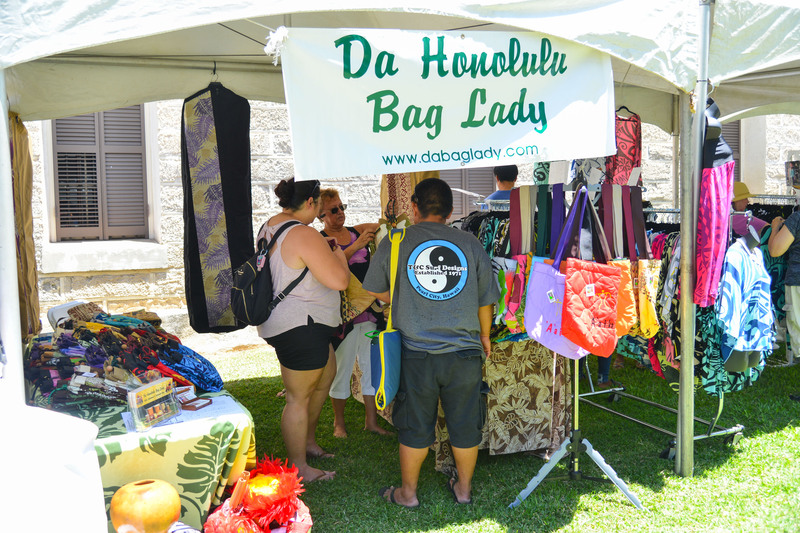 To me, it is like an annual reunion with the regular and new vendor participants. 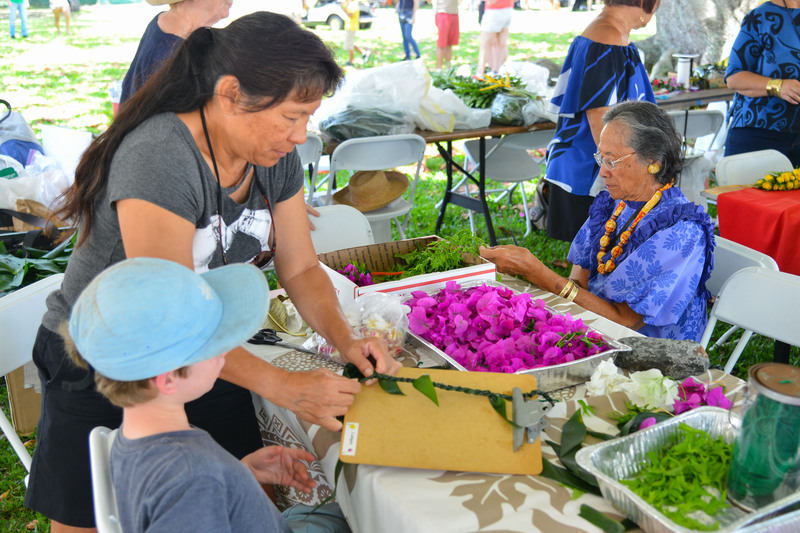 Aloha ALL of Moanalua Gardens Foundation…..Mahalo Nui for an awesome event! 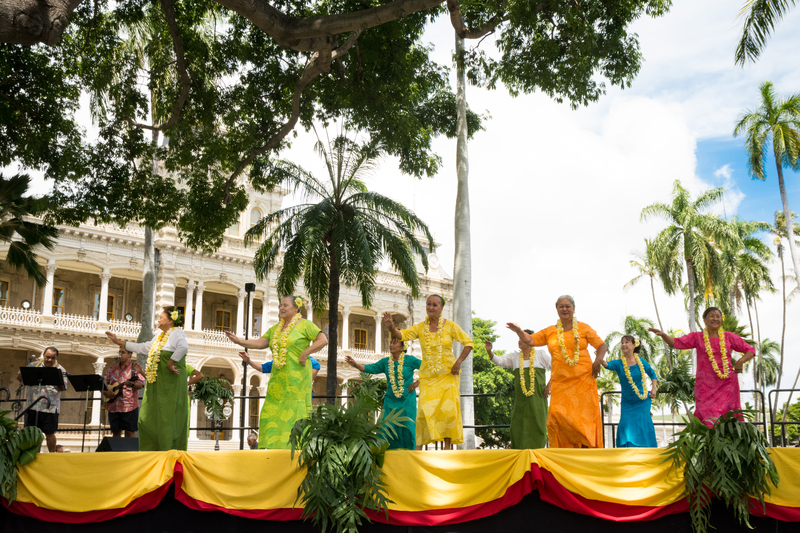 It is a privilege to be able to participate at an event on the grounds of Iolani Palace and you’ve made it a SUCCESSFUL one at that! 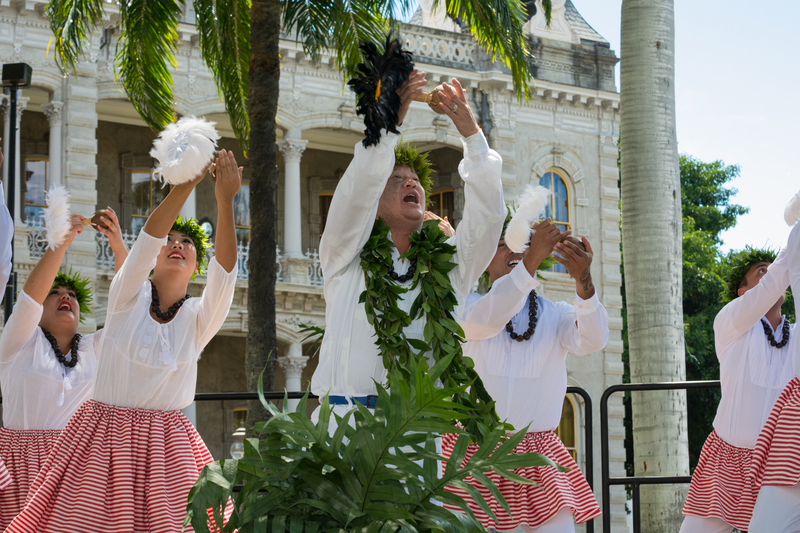 Hats off to your staff and crew, along with the Friends of Iolani Palace. The process has improved tremendously and it all begins with open communication which you (MGF) has initiated on behalf of the Vendors. Congratulations on a very successful Prince Lot Festival. 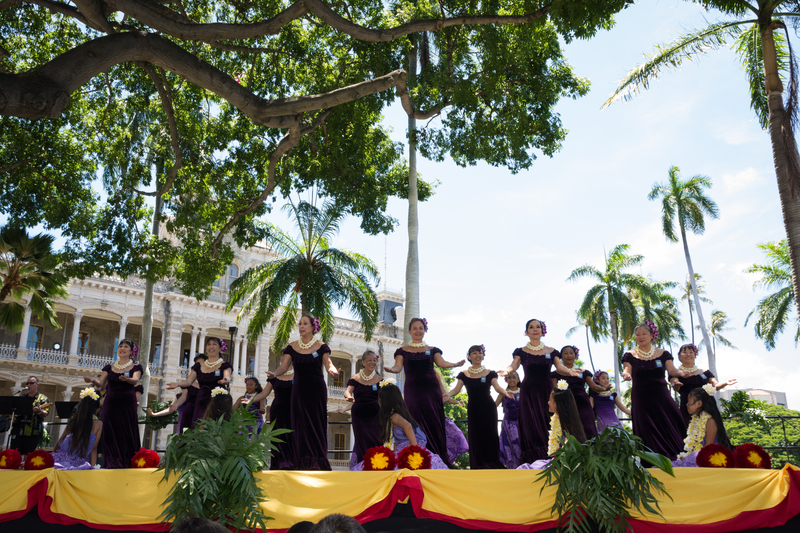 I felt like we were back at Moanalua because of the trees. 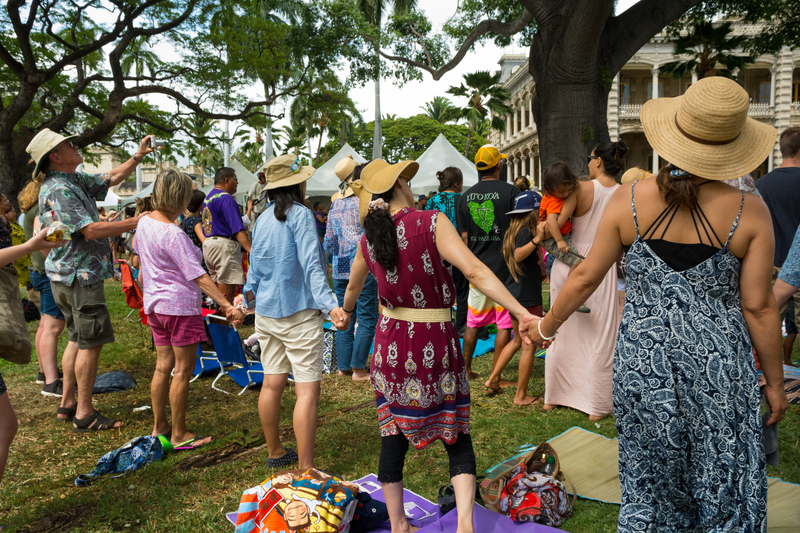 If I can kōkua, please let me know. Your staff is exceptional!!! 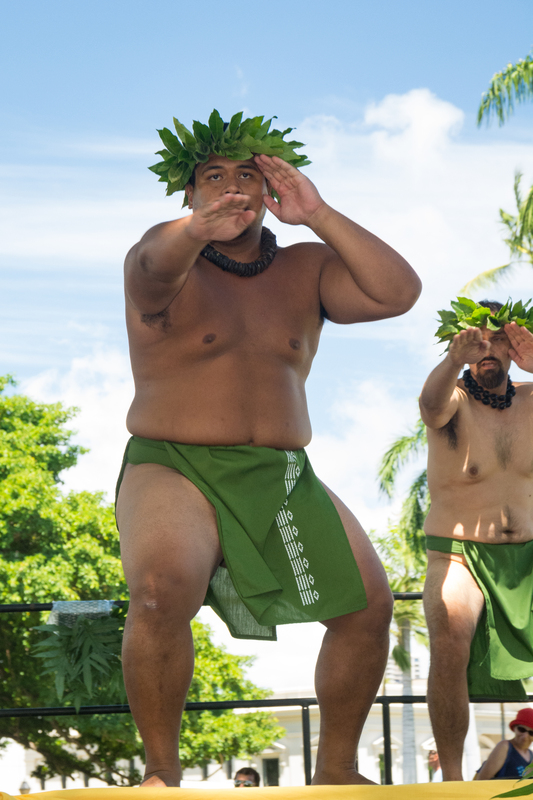 Mahalo for the hospitality. 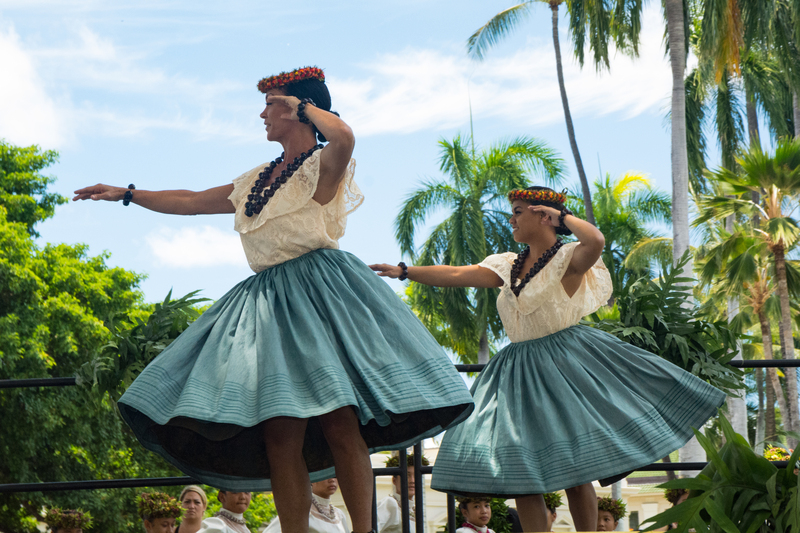 There is nothing to not like about the grounds of our hale ali`i. 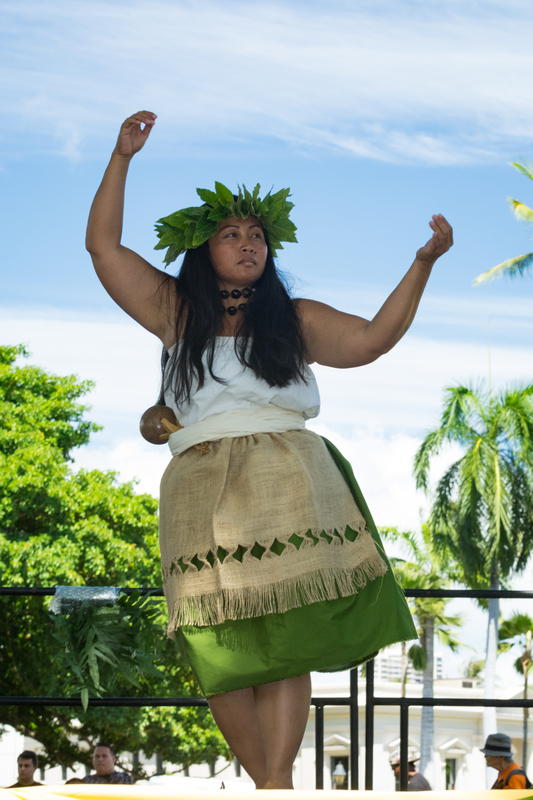 The comfort of the malu and the audience made the venue so much better. 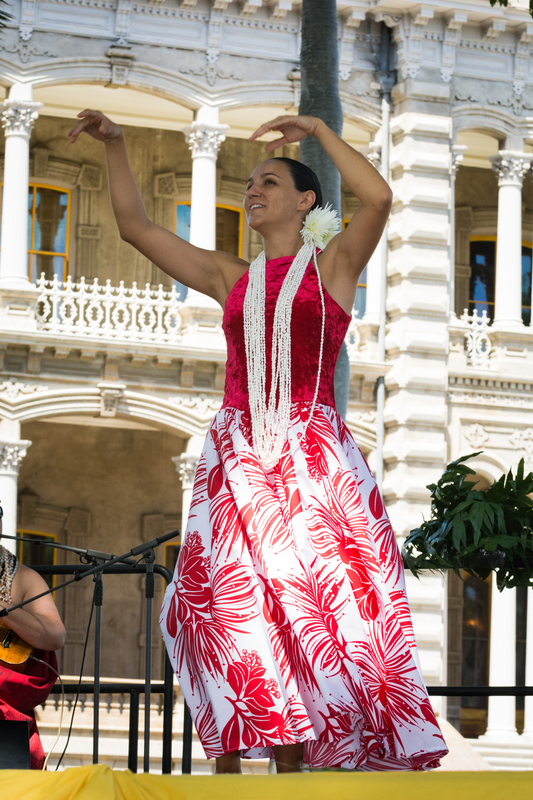 All in all it was a wonderful day of hula. We are so humbled by the experience and the opportunity. 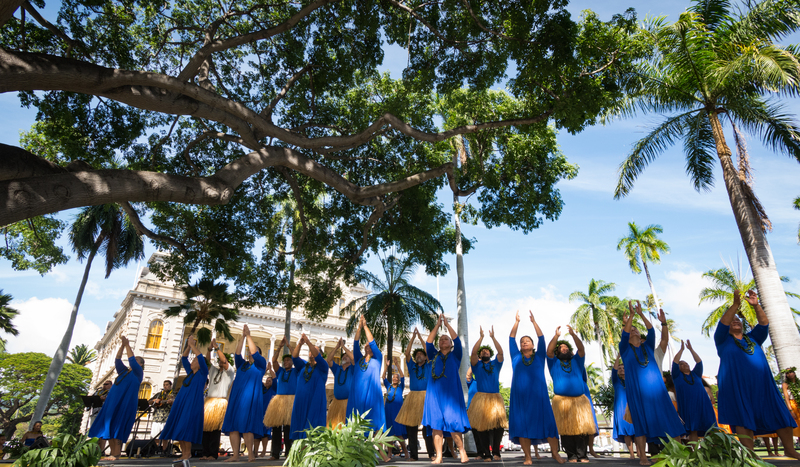 Mahalo to you and your staff. 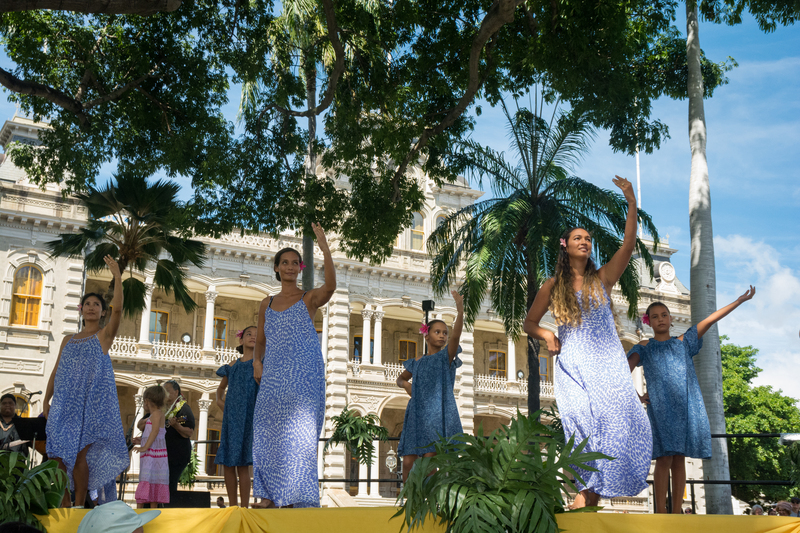 Mahalo nui for the opportunity to share our hula legacy at Moanalua Gardens Foundation’s Prince Lot Hula Festival at ‘Iolani Palace. 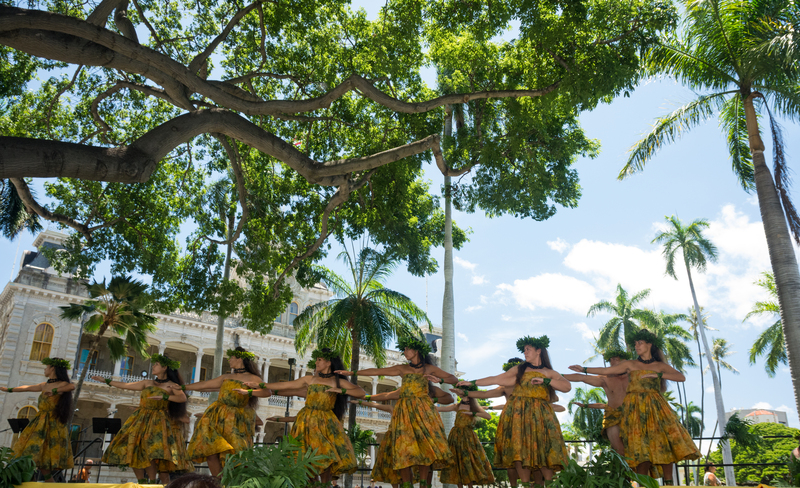 We enjoy being on the grounds of the home of our ali’i. It feels like being at our own home and not just as a guest at someone else’s home. 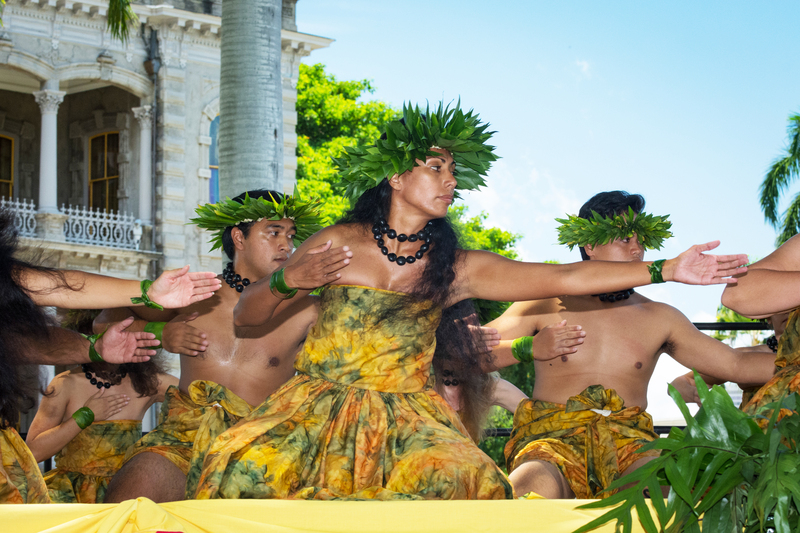 Also, we enjoy participating in the Prince Lot Hula Festival each year as well as promoting the event through T.V. spots. Please call on us at any time if we can be of help in any way. 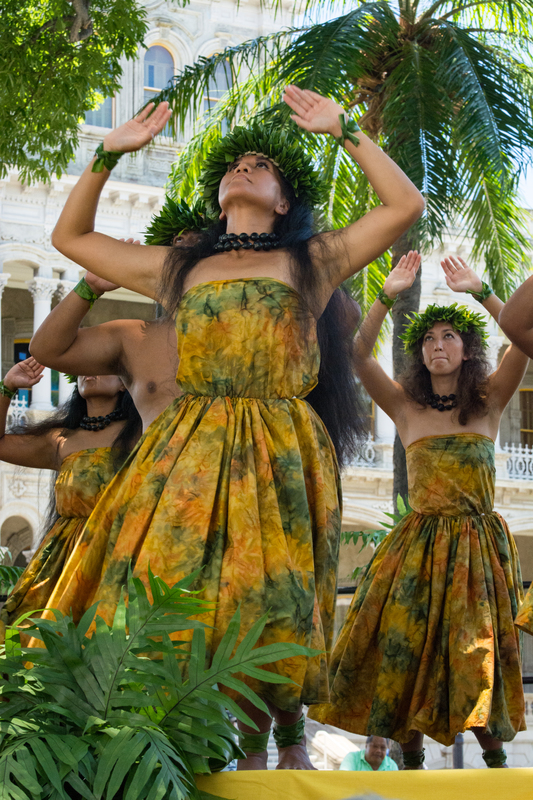 Mahalo nui loa for all that you do for the preservation of hula. 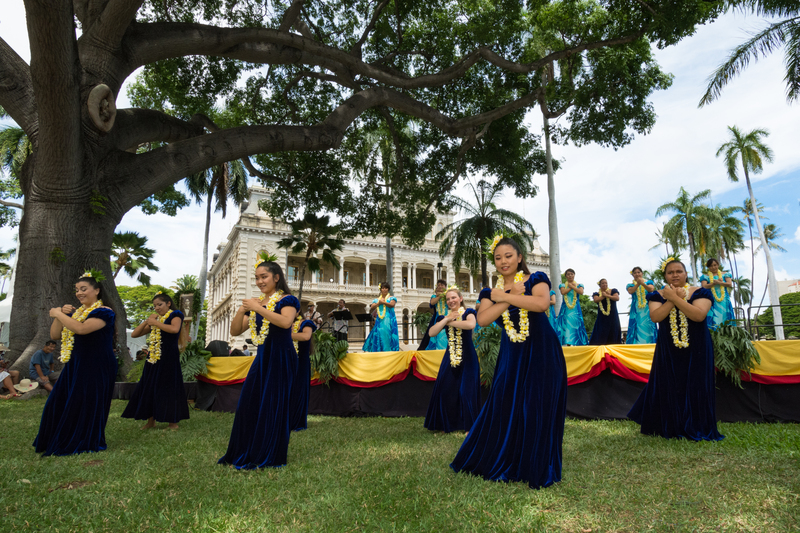 Ka Hanohano O Kamehameha…The Glory of Kamehameha, the 41st Annual Prince Lot Hula Festival taking place at Iolani Palace on Saturday, July 21, from 9 a.m. to 4 p.m., and Sunday, July 22 from 10 a.m. to 3 p.m. will showcase twenty of Hawai`i’s finest hālau hula (hula groups) over the festival weekend. A performance line-up is attached. 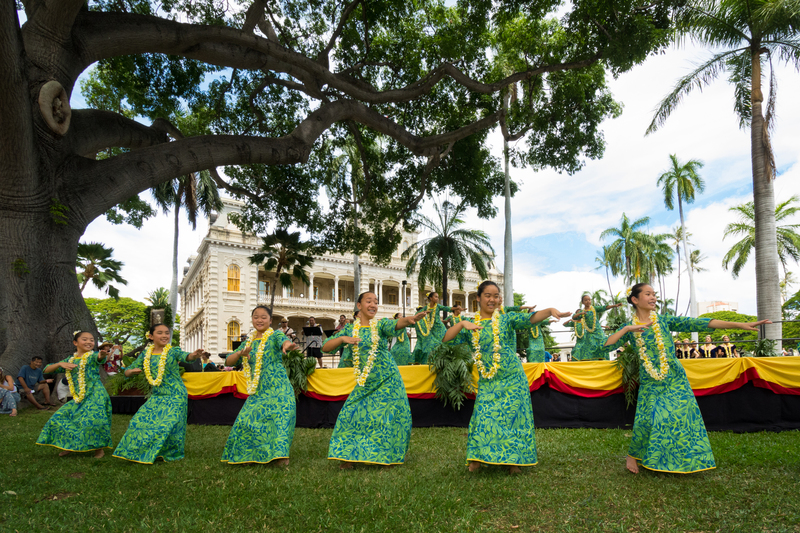 The largest non-competitive hula exhibition in Hawai‘i, the festival will return to Iolani Palace where Prince Lot Kapuāiwa maintained his official residence. 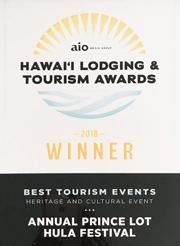 Presented by Moanalua Gardens foundation (MGF), a non-profit organization dedicated to preserving and perpetuating Hawaii`s native culture and natural resources, the festival recently won the 2018 Best Tourism Award for Heritage and Culture from aio Media and Hawaii Lodging & Tourism Association. 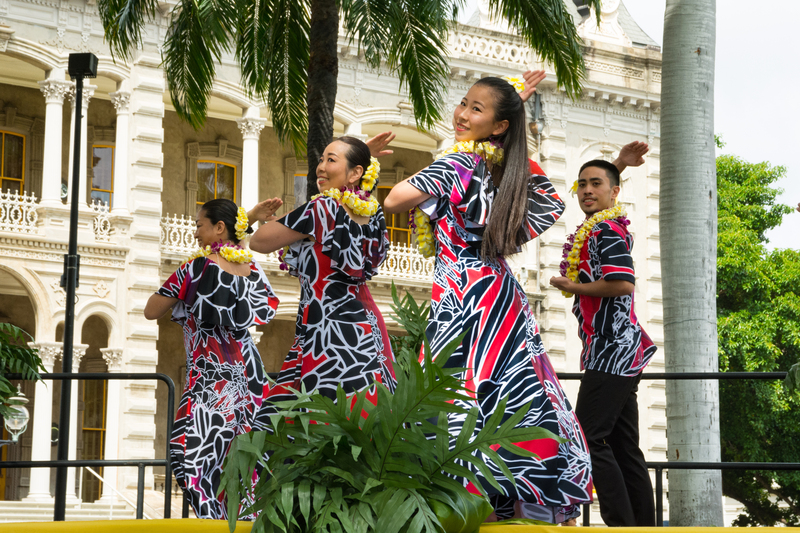 The Hawaii Tourism Authority is the Presenting Sponsor. 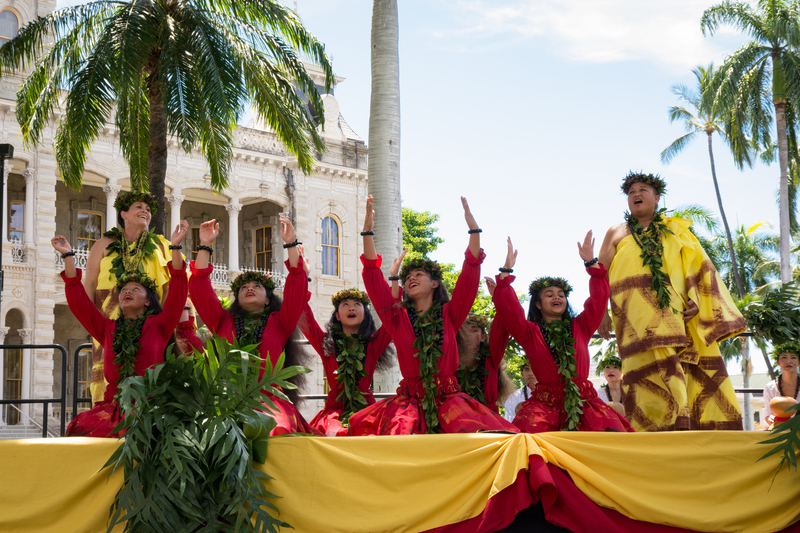 Festival highlights include an impressive Opening Ceremony led by the Royal Order of Kamehameha, Chapters 1, 6 and 8, on Saturday at 9 am followed by the presentation of MGF’s prestigious Malia Kau Award to sisters and Nā Kumu Hula Pualani Kanaka’ole Kanahele and Nalanai Kanaka’ole of the renowned Hālau o Kekuhi from Hawai`i Island. 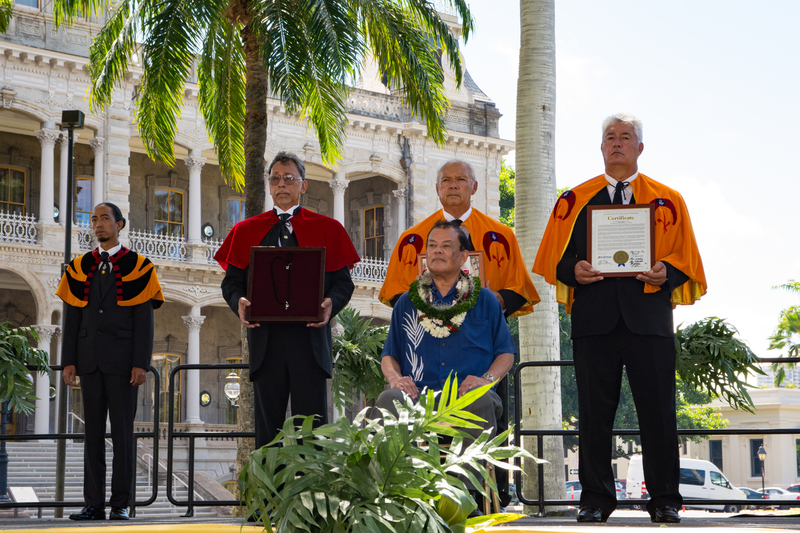 This award is given solely to kumu hula who have, over their lifetime, made significant contributions to perpetuating Hawaii’s hula traditions and culture. 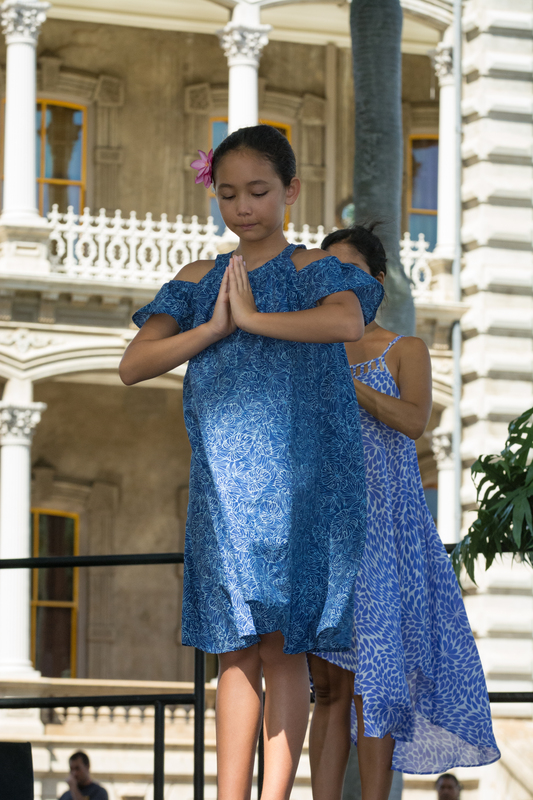 “Moanalua Gardens Foundation is proud to recognize Pua and Nalani for their leadership in advancing the art of hula worldwide and achieving in their own hālau a level of excellence that inspires all hula practitioners,” said Alika Jamile, Executive Director. 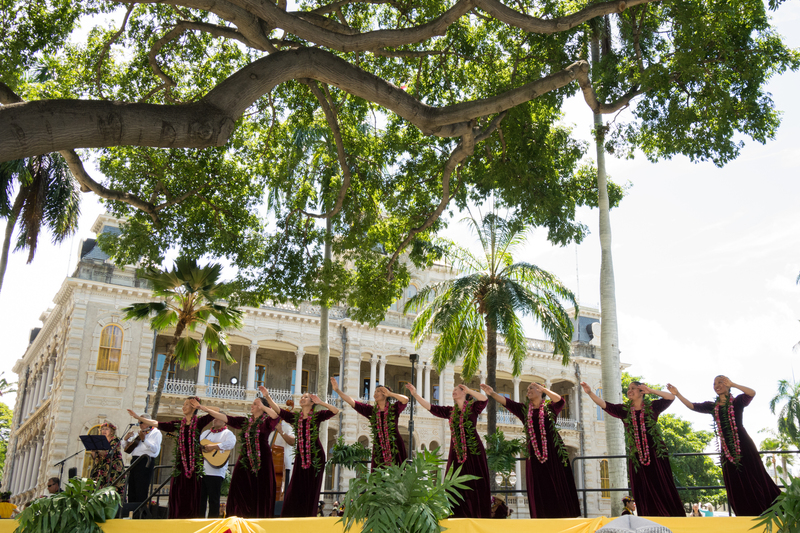 Twelve hālau hula will be showcased on Saturday beginning at 9:30 am with Hālau o Kekuhi and including, Coline Aiu’s Hālau Hula O Maiki, Niuli`i Heine’s Nā Pualei o Likolehua, and Maui’s Kamaka Kukona’s award-winning Hālau o Ka Hanu Lehua, and more. 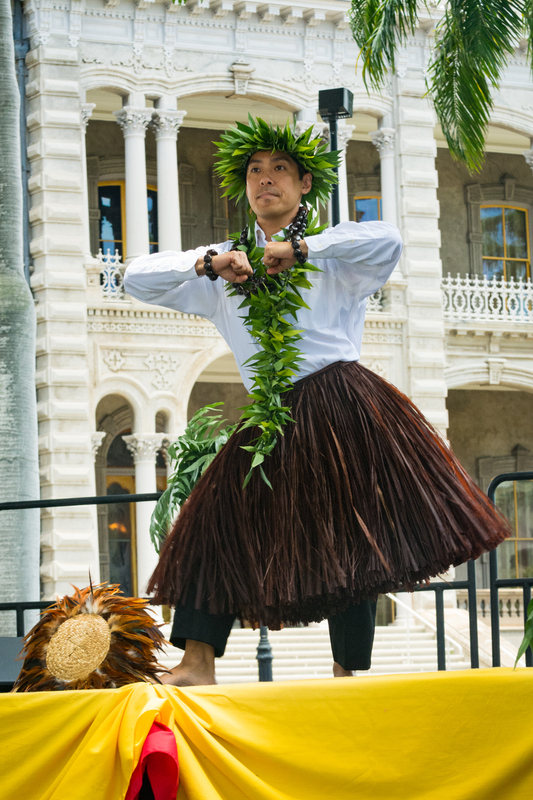 Puna Kalama Dawson’s Ka Ipu Ha`a o’ Kekauilani, Na Pua Hala o’ Kau`ai, Japana, Europa a me Canada will represent the island of Kau`ai. 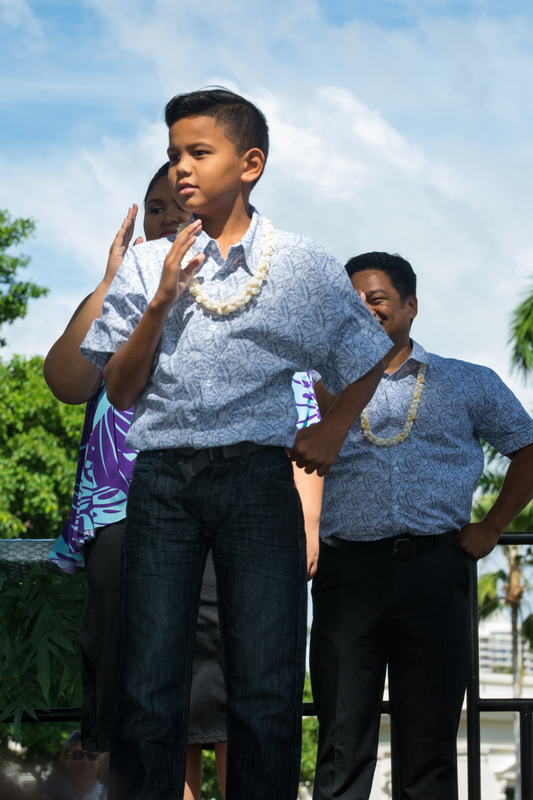 On Sunday at 10 am master chanter Kalena Silva will receive MGF’s second annual Namakahelu Oli Award for his contributions to the preservation of this ancient art form and for his extensive knowledge of oli and skill in chanting. 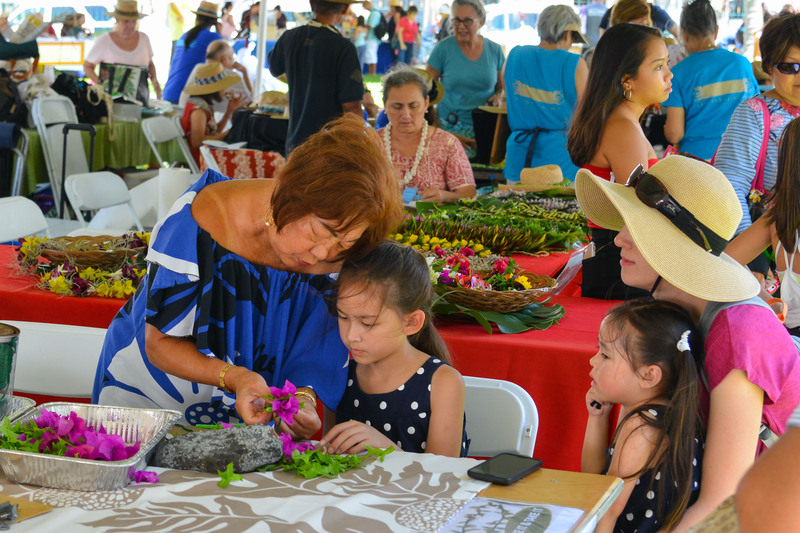 “As with our Malia Kau Award, Moanalua Gardens Foundation chose to select a foremost practitioner from Hawai’i Island for its Namakahelu Oli Award and Kalena is an outstanding choice,” said Jamile. 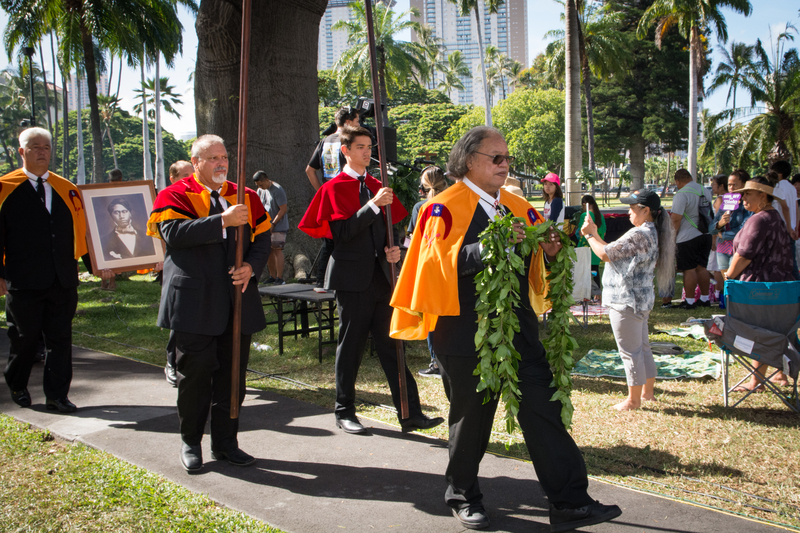 “Over a 30-year career, he has gained an excellent reputation for his study of and originality in chanting and has performed, taught, and lectured on Hawaiian music, dance, and language in Hawaiʻi and abroad,” Jamile continued. 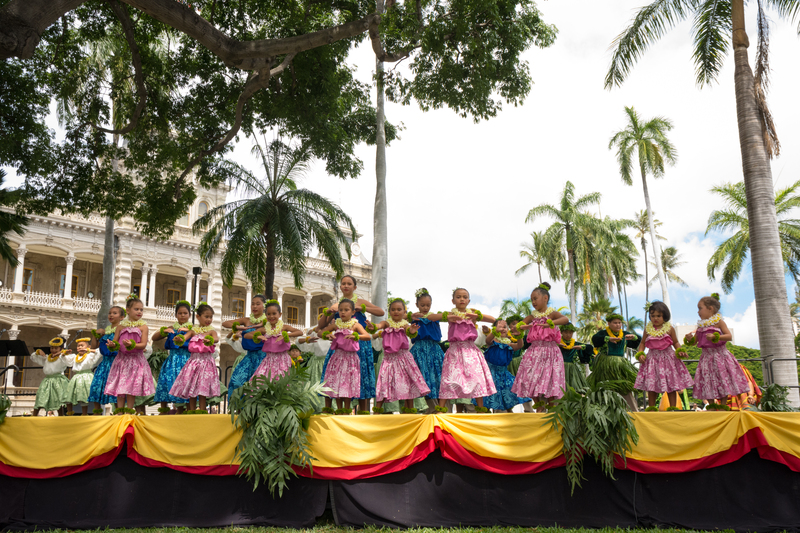 Sunday’s featured hālau include Leimomi I Maldonado’s Ka Hale I o Kahala Hālau Hula, Vicky Holt Takamine’s Pua Ali’i ‘Ilima, Hālau Hula ‘O Hokulani led by the late Hokulani De Rego’s three daughters, Leinani Lauaki, Kehaulani Kawai and Leonani Naho`oikaika, and more. 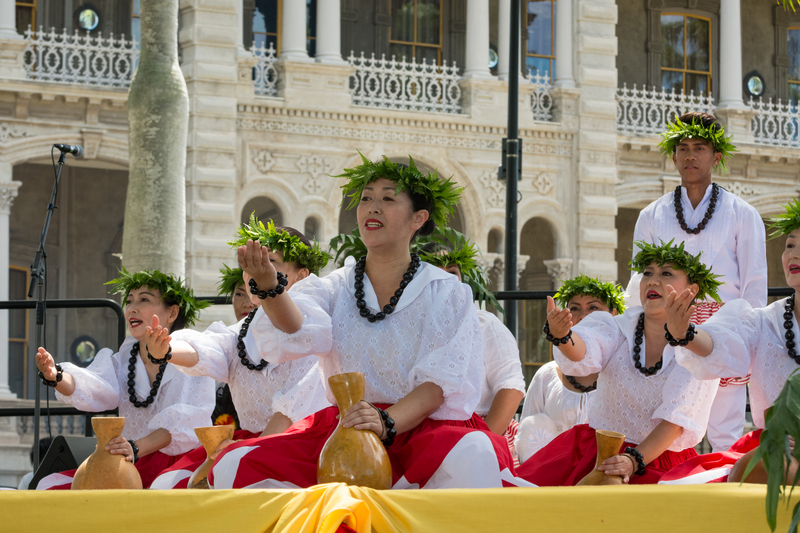 Hawai’i Island will again be represented by Lelehua Bray’s Hālau Hula Maunalei from Holualoa. 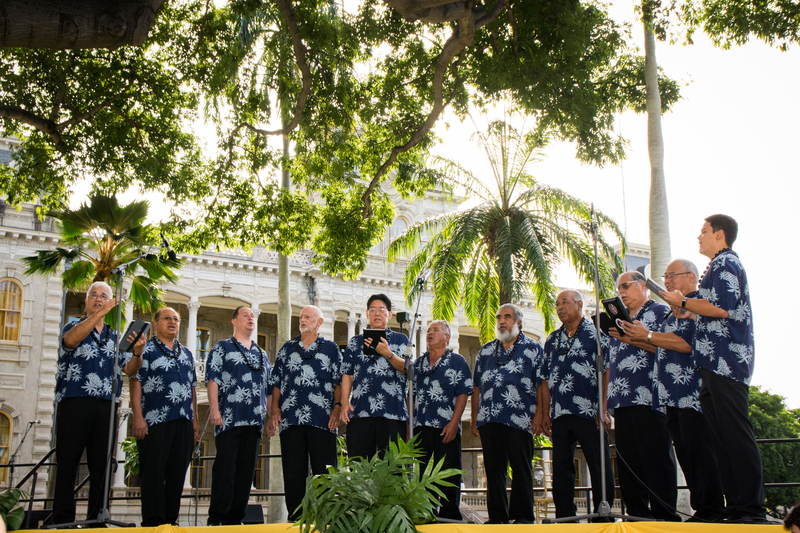 Making their debut at the festival will be Hālau o Ka Hanu Lehua and Kumu Hula Kamaka Kukona from Maui. 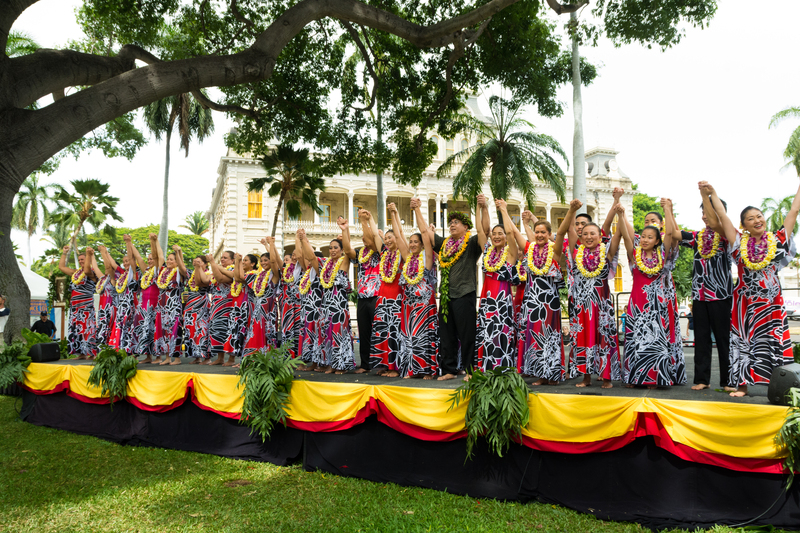 The hālau placed fourth in this year’s Merrie Monarch Festival for the mele Pōlehoonālani written by Kuana Torres Kahele and Kukona won the 2018 Nā Hōkū Hanohano Male Vocalist of the Year Award. 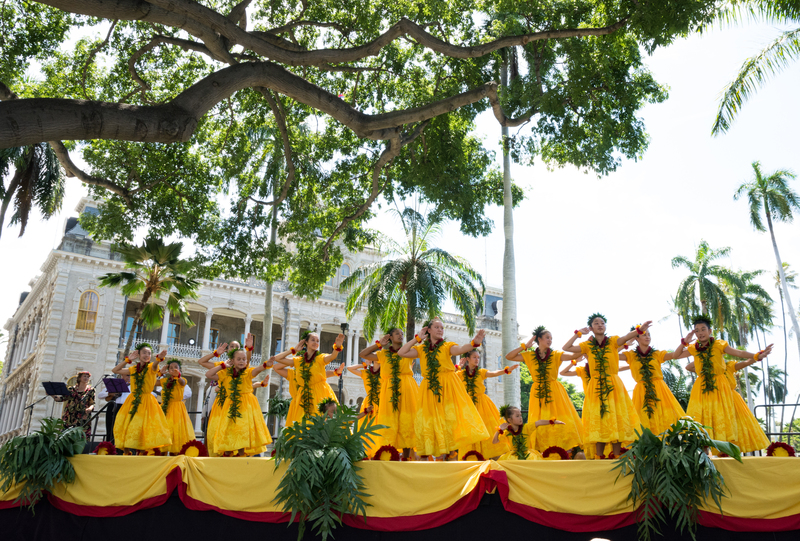 Also, Hui Ho’oulu Aloha and Kumu Hula Pomaikai’i Kreuger will be performing for the first time. 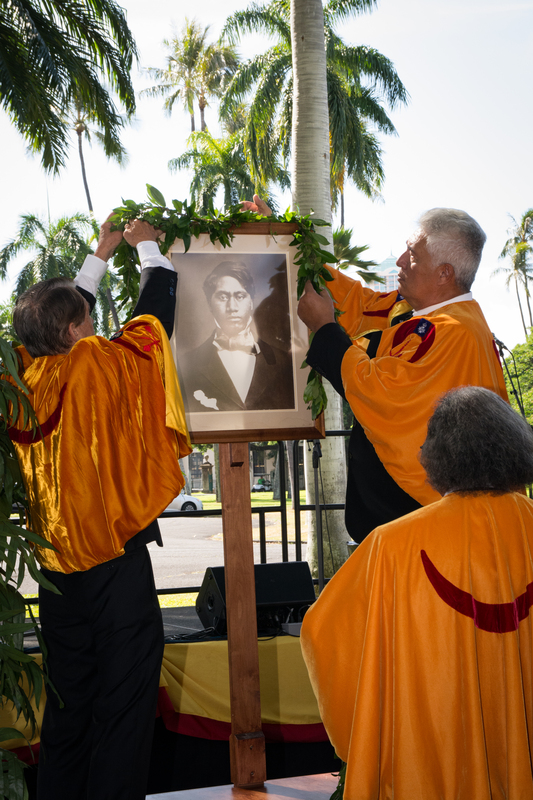 One of the hālau founders, Cy Bridges, received the inaugural Namakahelu Oli Award last year. 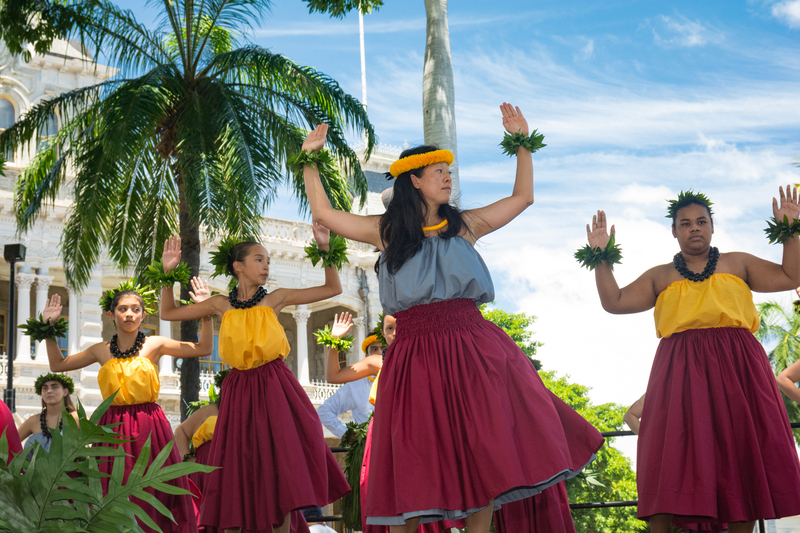 Other highlights include a pre-festival concert by the Kamehameha Alumni Glee Club on Saturday at 8:30 am, a Hawaiian-themed craft fair featuring local crafters, demonstrations of traditional Hawaiian arts by noted cultural practitioners, including poi pounding, lauhala weaving, kapa making, ipu heke making, feather lei making, ukulele making and more. 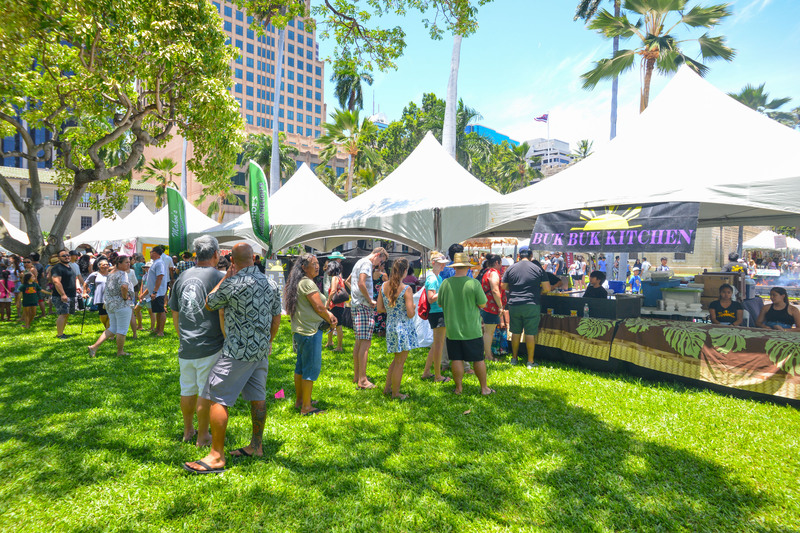 Food vendors will offer a variety of mouth-watering local specialties featuring Hawaiian plates, shave ice, and other island favorites. 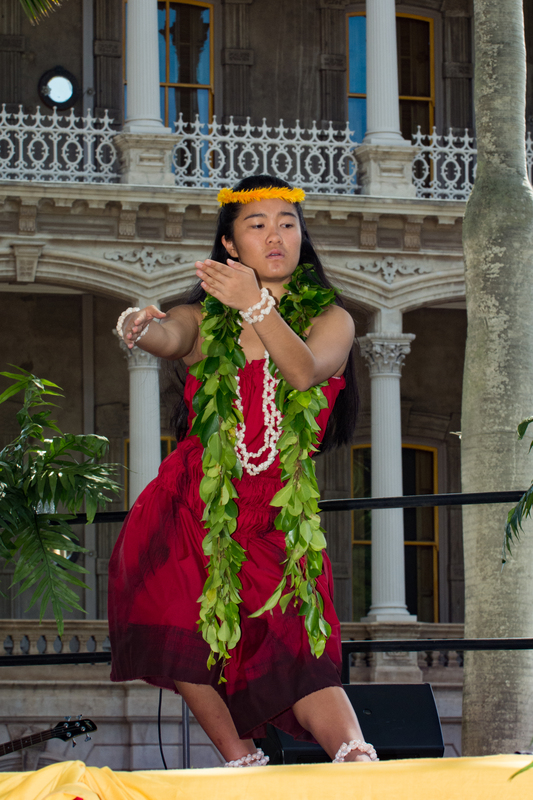 On Saturday and Sunday, entrance to the first floor of Iolani Palace will be free. 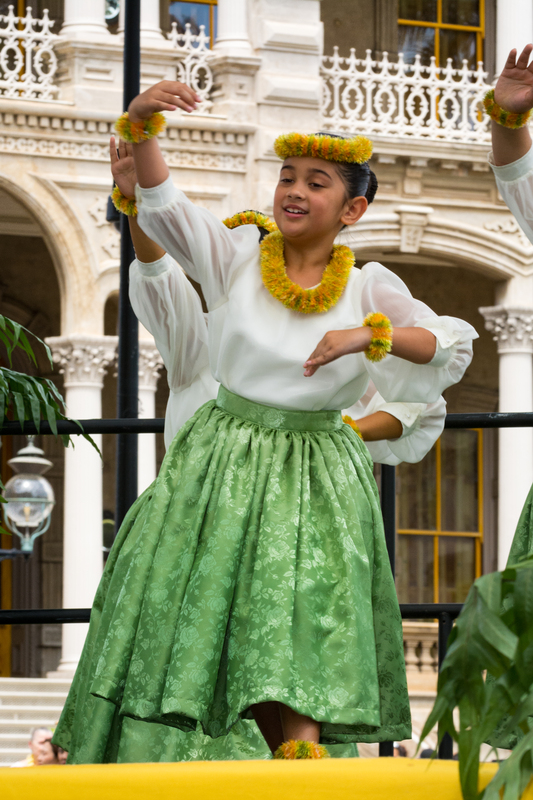 “We welcome both kama`āina and malihini,” to our second Prince Lot Hula Festival at Iolani Palace and invite the entire community and visitors to join us for this special tribute to Hawaii’s ali’i who lived and ruled on the sacred grounds of the Palace,” said Jamile. 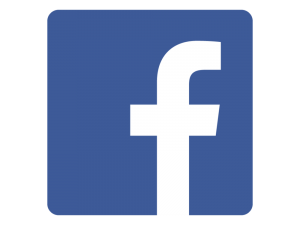 There is no charge to attend the festival, however, a button donation to MGF is requested to raise funds to support the event. 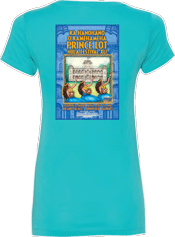 Limited edition tee shirts and a souvenir poster will be on sale. 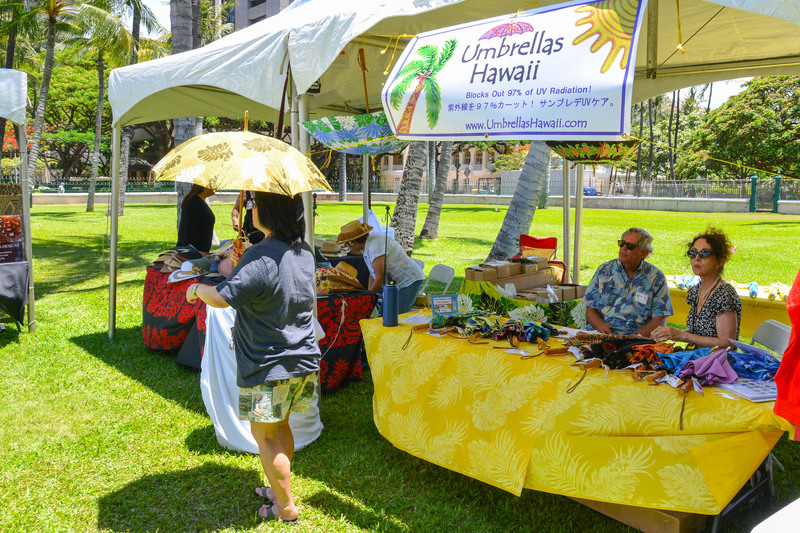 Proceeds from these merchandise sales will help cover the costs of the festival. 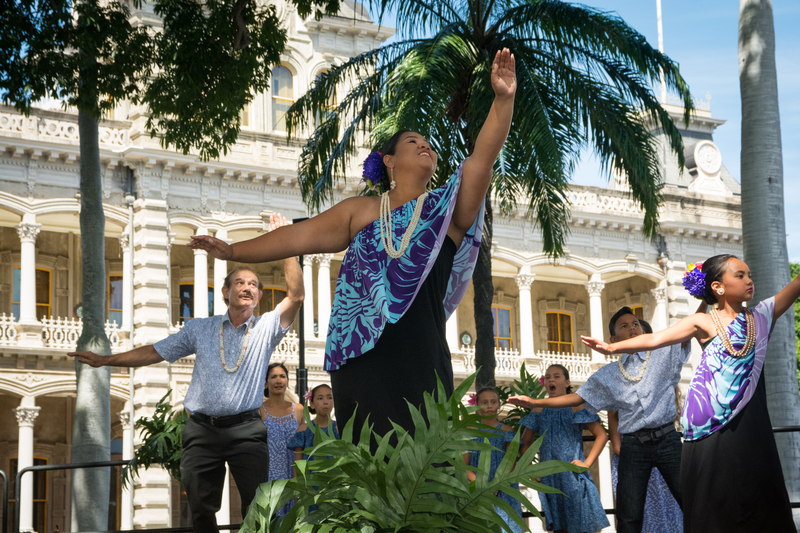 The public, and visitors, are welcome to bring their low beach chairs and mats and enjoy the fun, food and festivities at historic Iolani Palace. No commercial photography is allowed. 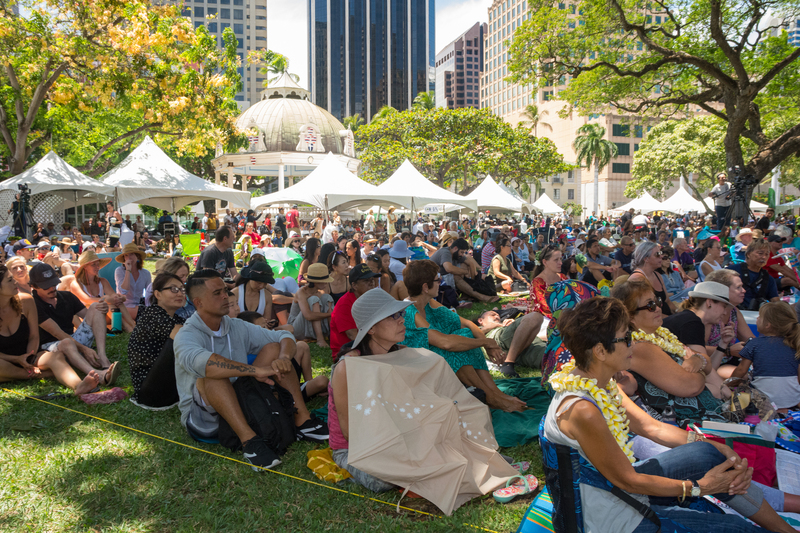 Festival sponsors and supporters include, National Endowment for the Arts, State Foundation on Culture and the Arts, the Office of Hawaiian Affairs, Douglas Emmett, Kamehameha Publishing, Hawaiian Airlines, The Queen’s Medical Center, Matson Navigation, Royal Hawaiian Center, IATSE Local 665, Hawai‘i Visitors and Convention Bureau, O‘ahu Visitors Bureau, the Honolulu Star Advertiser, MidWeek, ‘Ōlelo Community Media, Pasha Hawaii, Iolani Palace, Urgent Care Hawaii and others. 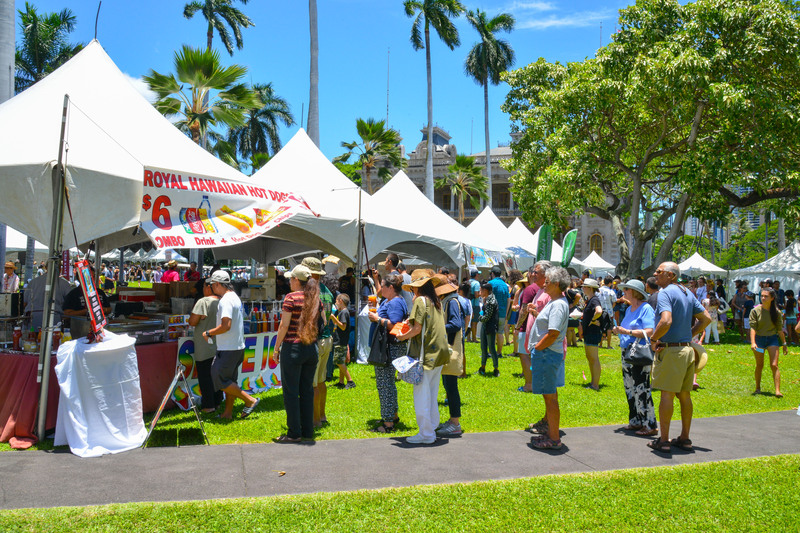 Named in memory of Prince Lot, who later reigned as King Kamehameha V, the festival was founded in 1978 by MGF and now attract thousands of residents and visitors each year. 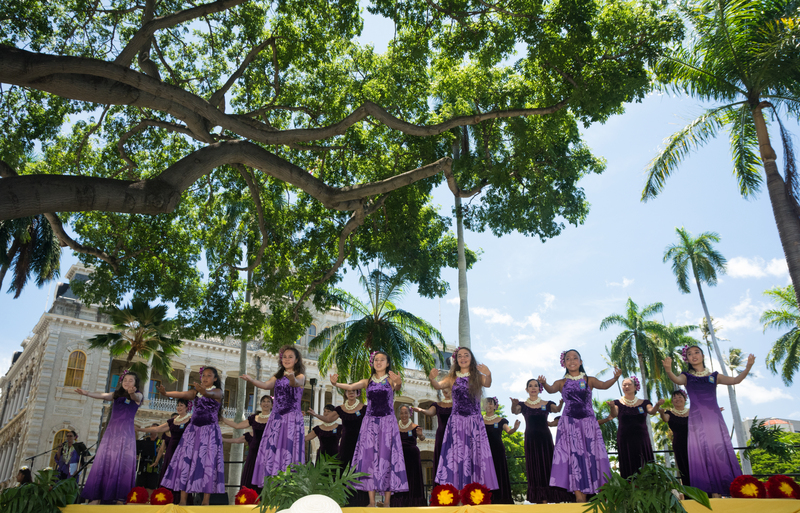 Click to view participating hālau and a festival performance schedule. 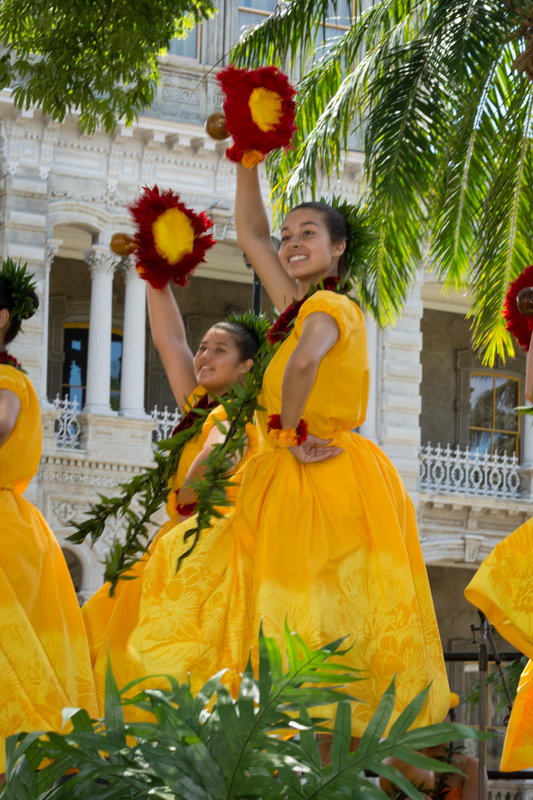 For more information about about the festival and MGF, please call 808.839.5334. 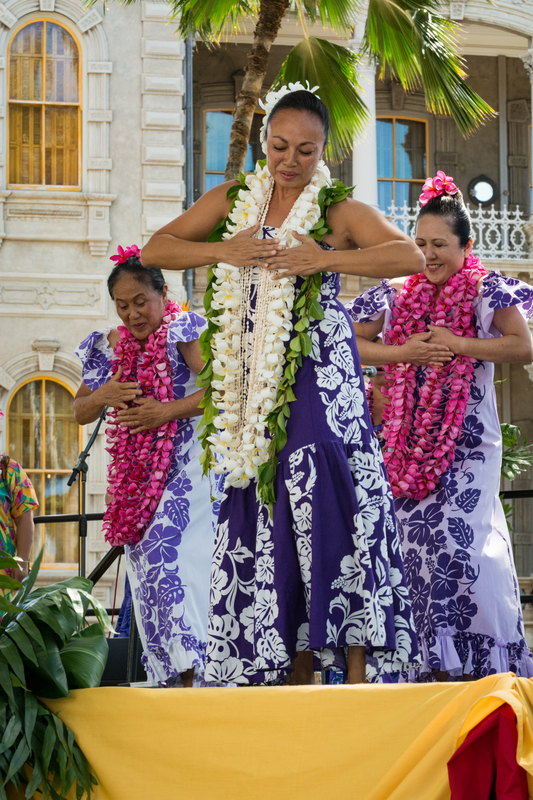 The Annual Prince Lot Hula Festival took the top award for Best Tourism Events – Heritage and Cultural Event at the inaugural aio Media Hawai’i Lodging & Tourism Awards held recently at the Hawai’i Convention Center. 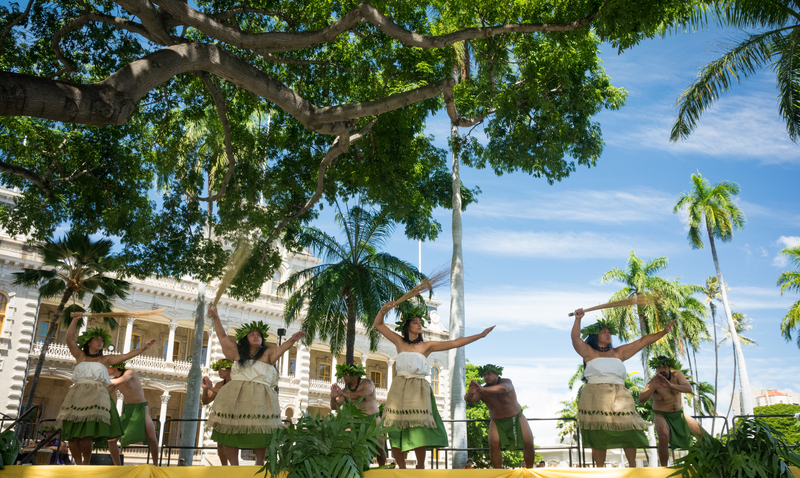 Created to recognize leadership and excellence in the tourism industry, the awards honored organizations and individuals in 14 separate categories for their contributions to Hawai’i’s largest industry, tourism. 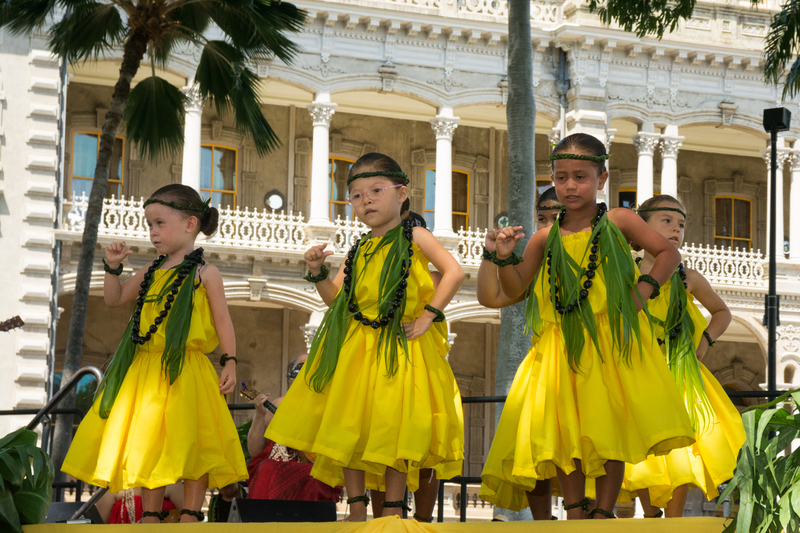 The 2018 festival, Ka Hanohano O Kamehameha…The Glory of Kamehameha, the 41st Annual Prince Lot Hula Festival, will return to Iolani Palace on Saturday, July 21, from 9 a.m. to 4 p.m., and Sunday, July 22 from 10 a.m. to 3 p.m. 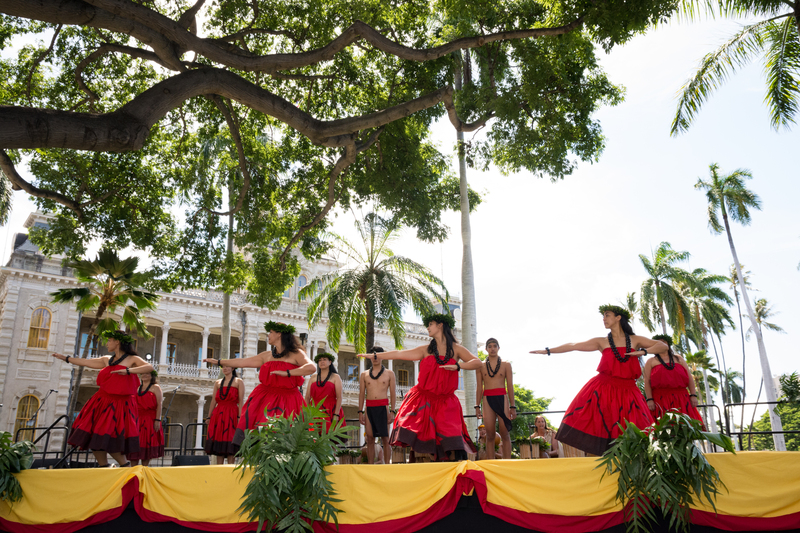 The festival honors Prince Lot Kapuāiwa, who helped reprise hula and reigned as Kamehameha V from 1863 to 1872 at his official residence on the palace grounds. 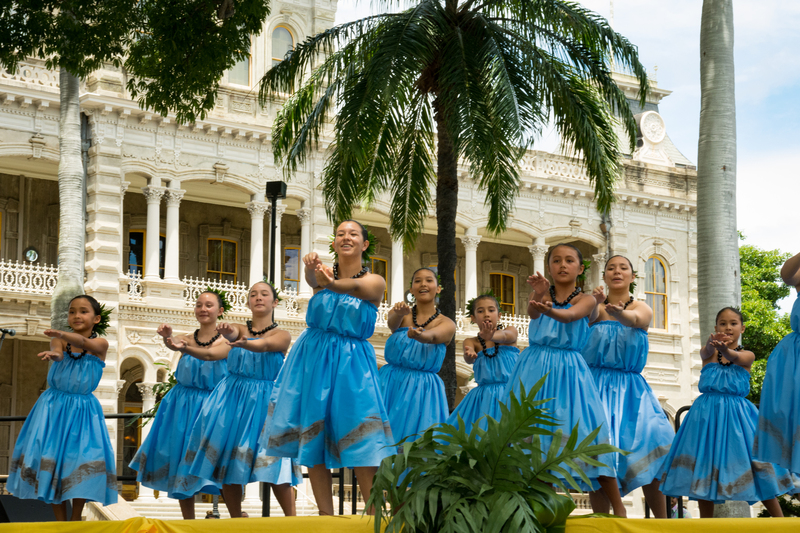 Admission to the Palace during the festival will be free. 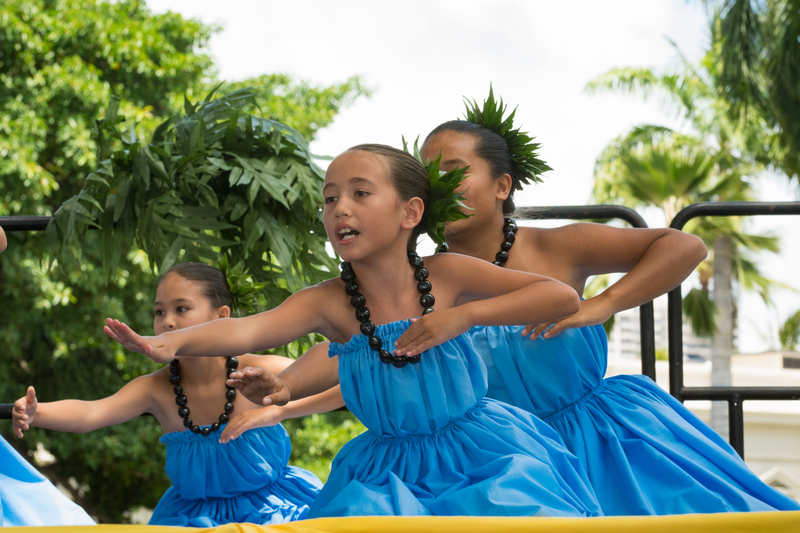 Presented by Moanalua Gardens Foundation (MGF), the festival is the largest non-competitive hula celebration in the islands. 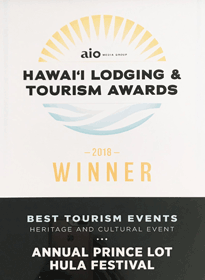 “We are deeply grateful to aio Media and the Hawai’i Lodging and Tourism Association for this award. 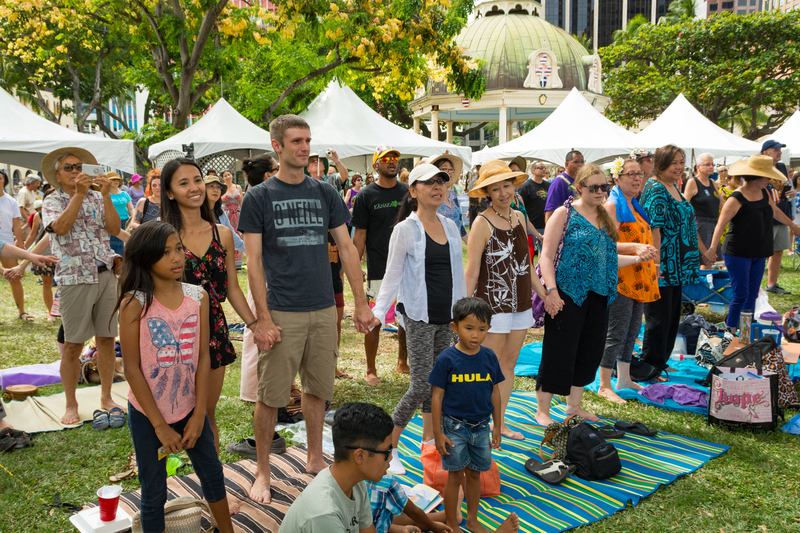 This recognition would not have been possible without the dedication and commitment of our Festival Committee, staff, volunteers, sponsors and donors, and our Board of Directors, who work tirelessly to make the festival the success that it is,” said Alika Jamile, Executive Director and President. 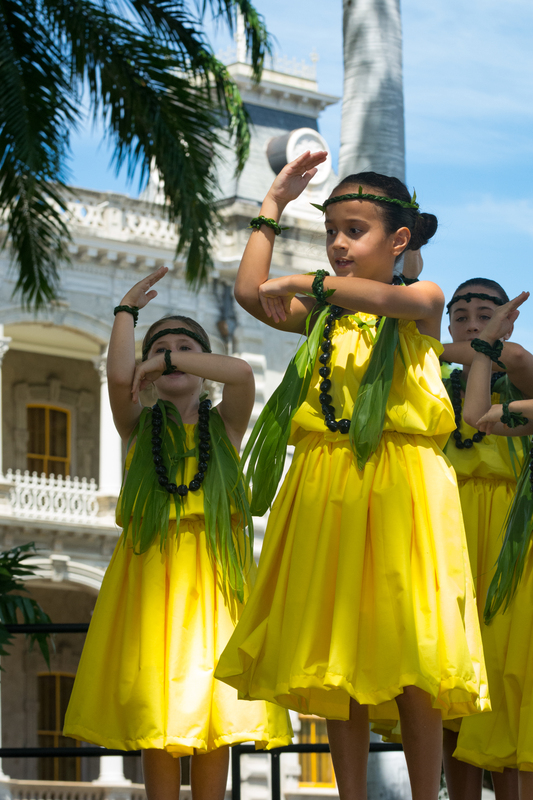 Founded in 1978 by MGF as a gift to the community, the festival now attracts thousands of residents and visitors each year. 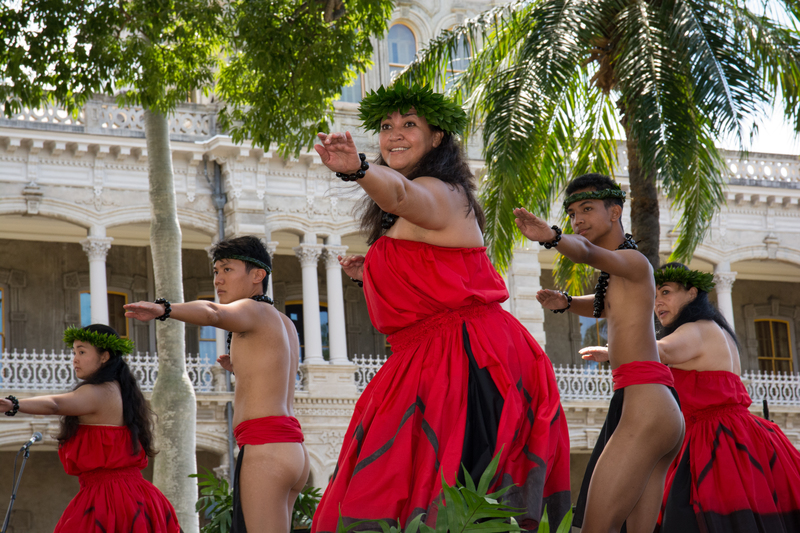 Opening ceremonies on Saturday will include the Royal Order of Kamehameha, presentation of MGF’s Malia Kau Award to renown Nā Kumu Hula Nalani and Pua Kanaka’ole, followed by an impressive line-up of premier hālau hula (hula groups) who will perform both kāhiko (ancient) and ‘auana (contemporary) hula. 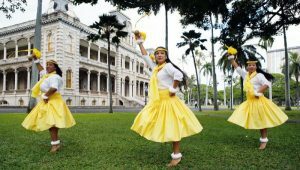 Hālau from every major island will be participating and their kumu have been encouraged to include dancers from their out-of-state branches. 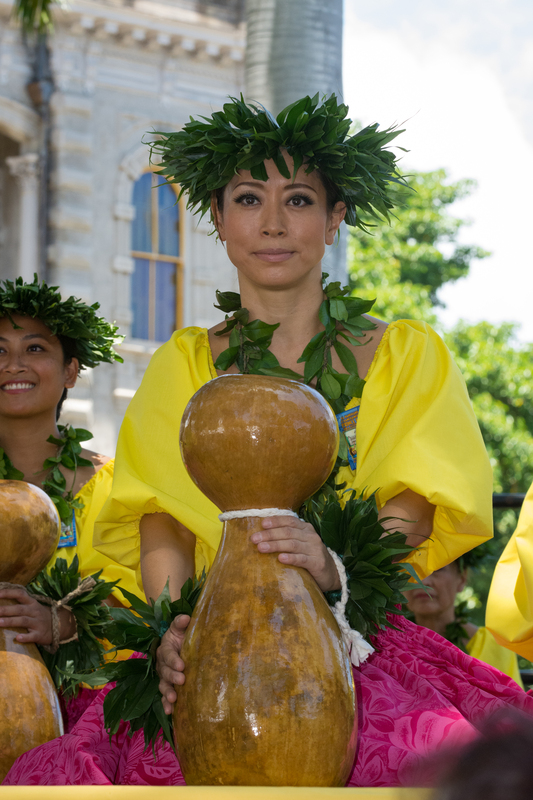 On Sunday, MGF will honor respected chanter Kalena Silva with its Namakahelu Oli Award as part of the opening program. 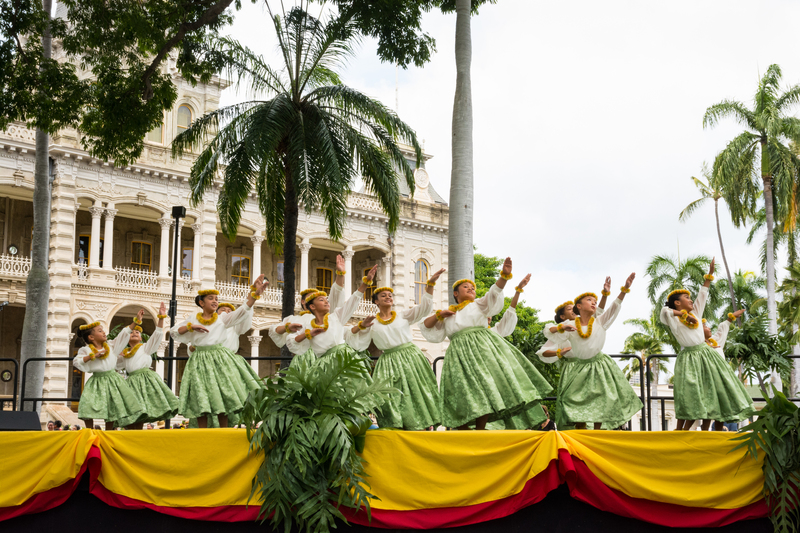 The event will also feature a Hawaiian-themed craft fair, cultural demonstrations, and more. 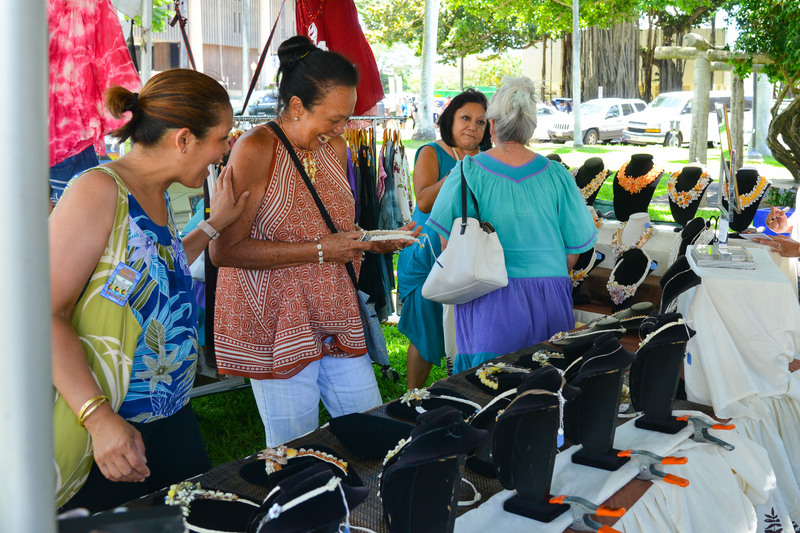 Local food and refreshments will be available for purchase throughout the day. 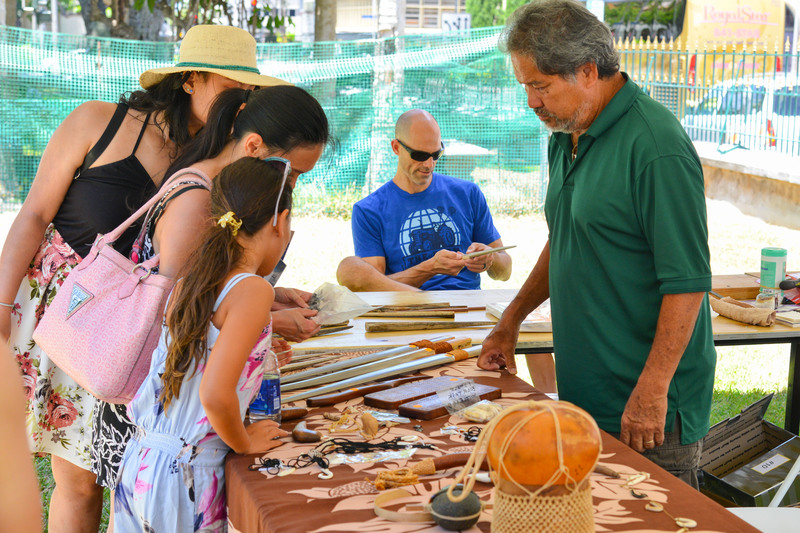 Limited edition tee shirts and souvenir kōkua buttons will be on sale. 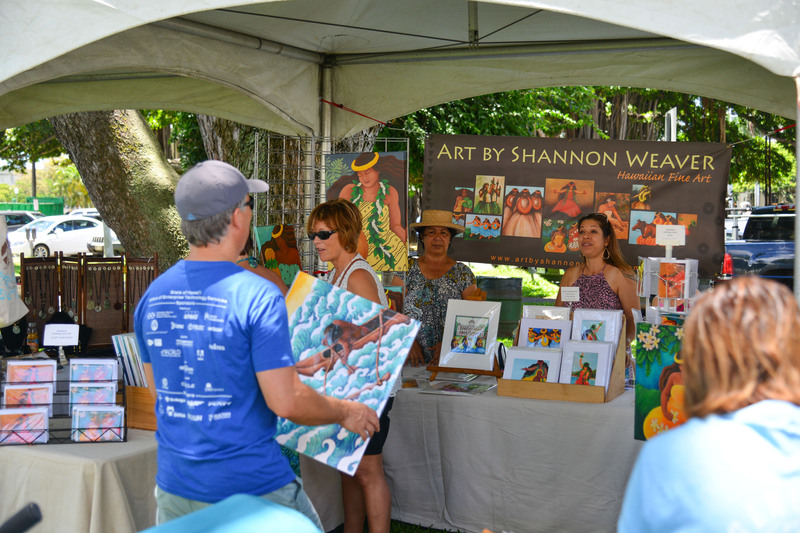 Proceeds from these merchandise sales will help cover the costs of the festival. 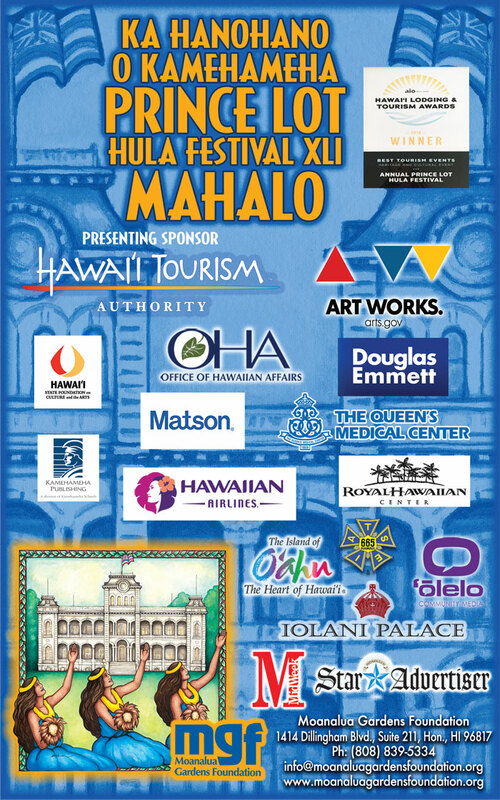 Festival sponsors and supporters include the Hawaii Tourism Authority, State Foundation on Culture and the Arts, the Office of Hawaiian Affairs, Iolani Palace, Hawaiian Airlines, Matson Navigation, Pasha Hawaii, First Hawaiian Bank, Hawai‘i Visitors and Convention Bureau, O‘ahu Visitors Bureau, the Honolulu Star Advertiser, MidWeek, ‘Ōlelo Community Media, and Urgent Care Hawaii. 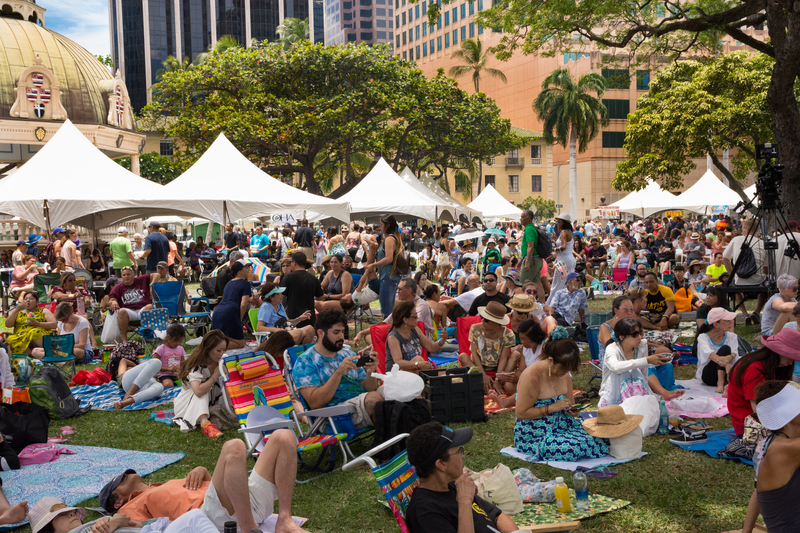 Founded in 1978 by MGF as a gift to the community, the festival now attracts thousands of residents and visitors each year. 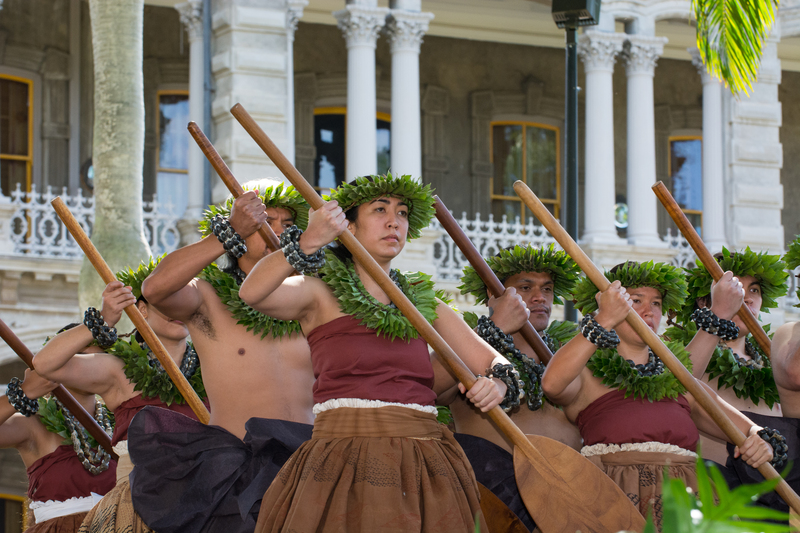 Opening ceremonies on Saturday will include the Royal Order of Kamehameha, presentation of MGF’s Malia Kau Award to renown Nā Kumu Hula Nalani and Pua Kanaka’ole, followed by an impressive line-up of premier hālau hula (hula groups) who will perform both kāhiko (ancient) and ‘auana (contemporary) hula. 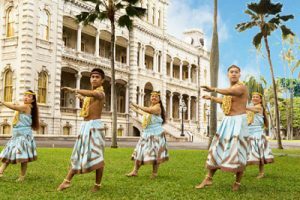 Hālau from every major island will be participating and their kumu have been encouraged to include dancers from their out-of-state branches. 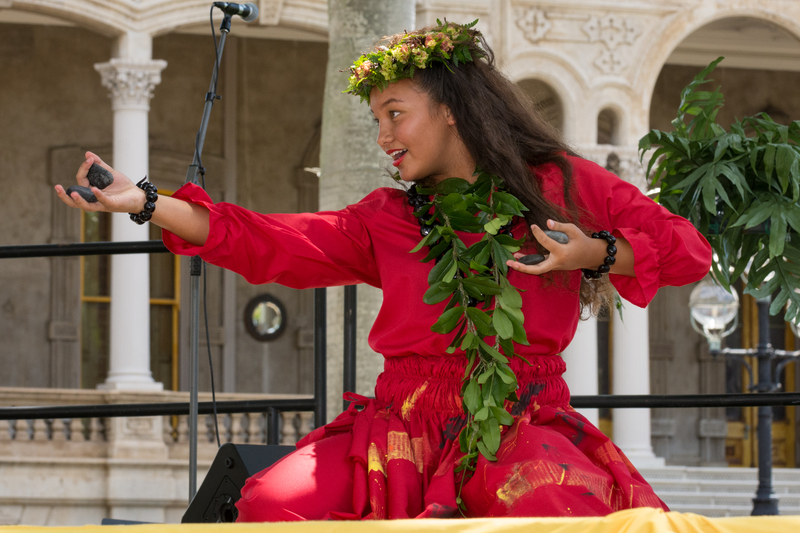 On Sunday, MGF will honor respected chanter Kalena Silva with its Namakahelu Oli Award as part of the opening program. 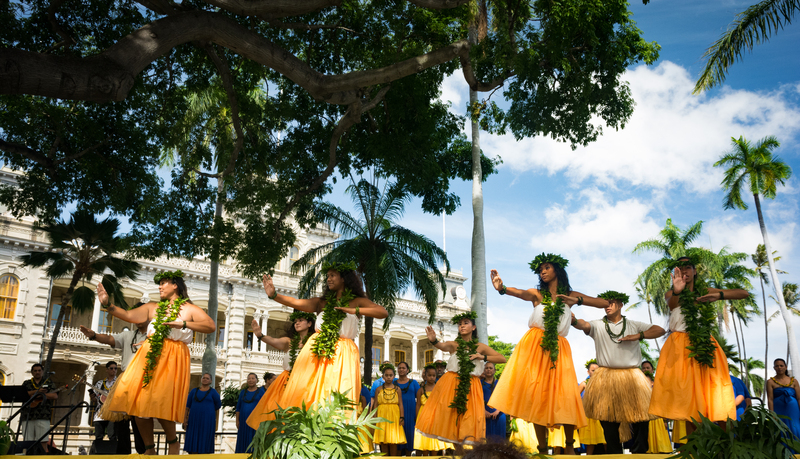 The event will also feature a Hawaiian-themed craft fair, cultural demonstrations, and more. 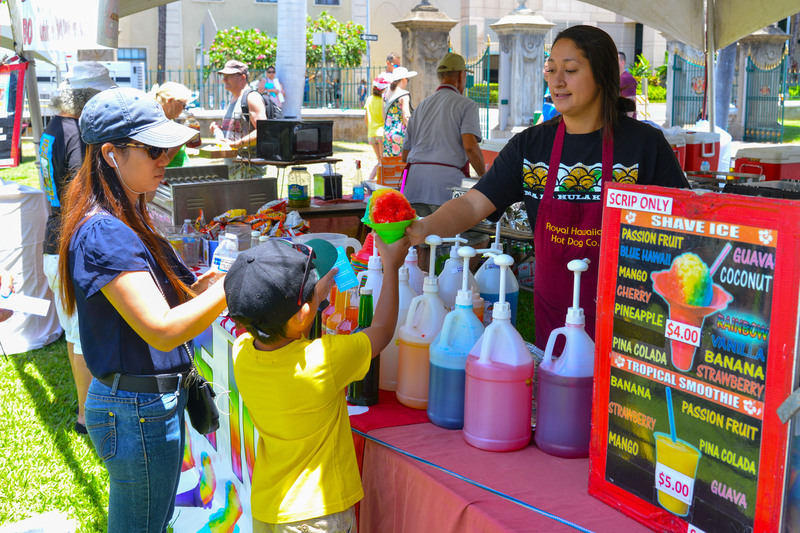 Local food and refreshments will be available for purchase throughout the day. 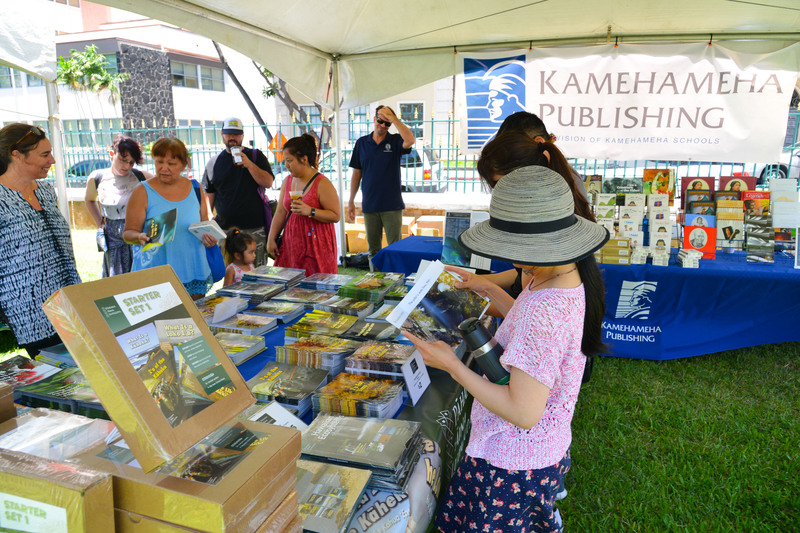 Limited edition tee shirts and souvenir kōkua buttons will be on sale. 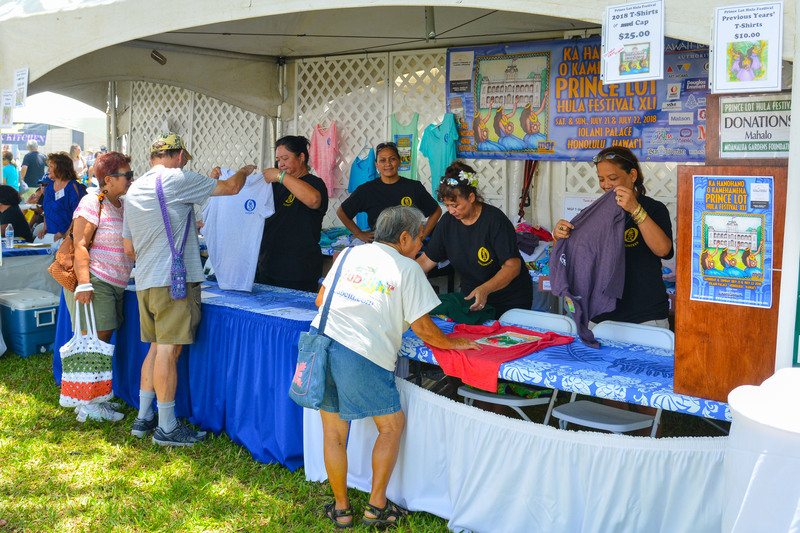 Proceeds from these merchandise sales will help cover the costs of the festival. 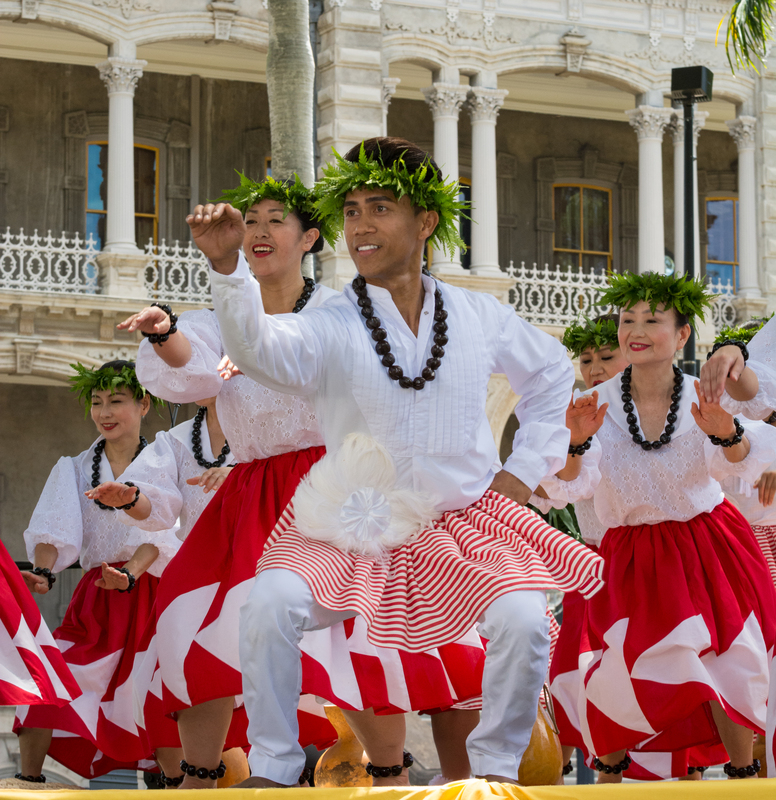 The public, and visitors, are welcome and encouraged to bring their beach chairs and mats and enjoy the fun, food and festivities in the magnificent setting of Iolani Palace. Commercial photography is not allowed. 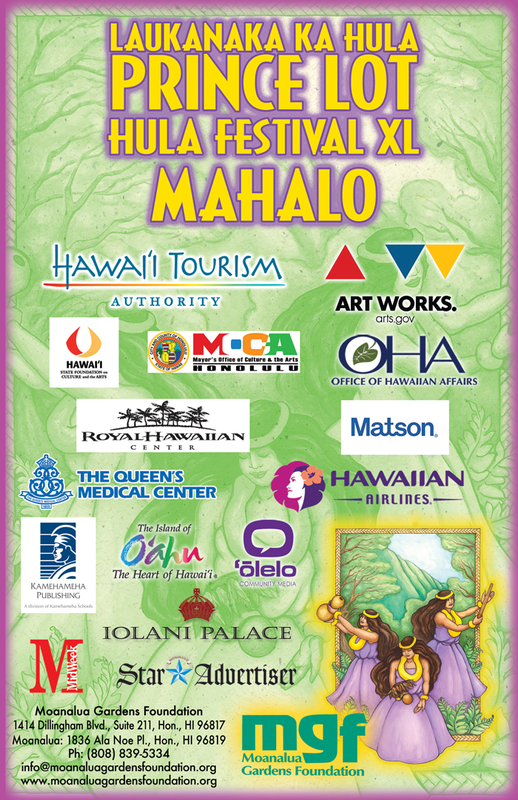 Festival sponsors and supporters include the Hawaii Tourism Authority, State Foundation on Culture and the Arts, the Office of Hawaiian Affairs, the City and County of Honolulu, Iolani Palace, Hawaiian Airlines, Matson Navigation, Pasha Hawaii, First Hawaiian Bank, Hawai‘i Visitors and Convention Bureau, O‘ahu Visitors Bureau, the Honolulu Star Advertiser, MidWeek, ‘Ōlelo Community Media, Urgent Care Hawaii and others. 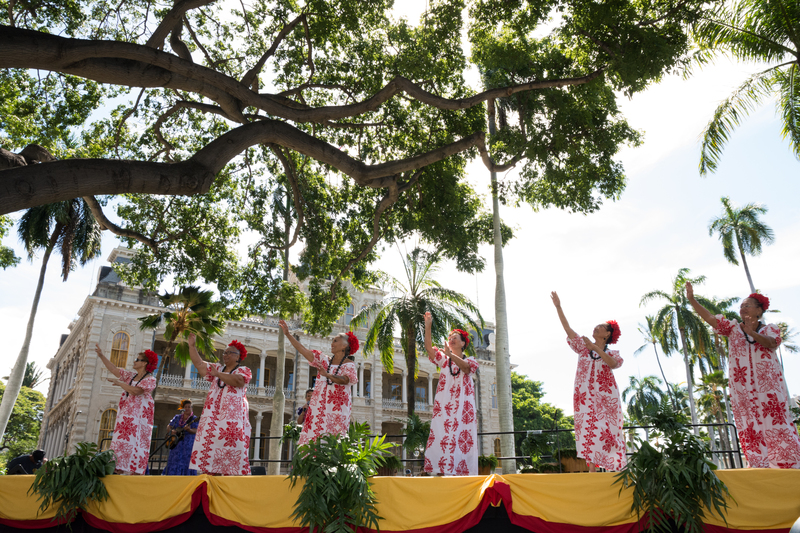 Participating hālau and a festival performance schedule will be announced at a later date. 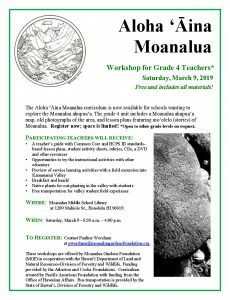 For more information, please email info@moanaluagardensfoundation.org or call 808.839.5334.